31/8/2014: Did President Putin Call for a Statehood for E. Ukraine? Yesterday, Russian President Vladimir Putin gave an interview to Interfax news agency in which he said (in Russian): "Президент России считает, что киевские власти должны начать переговоры по вопросам государственности юго-востока страны. "Нужно немедленно приступить к субстантивным, содержательным переговорам, и не по техническим вопросам, а по вопросам политической организации общества и государственности на юго-востоке Украины с целью безусловного обеспечения законных интересов людей, которые там проживают", – цитирует "Интерфакс" интервью Владимира Путина программе "Воскресное время" на Первом канале." This is being widely reported across all of the Western media as the Russian President calling for granting of independence to the Eastern Ukrainian regions, or calling for the creation of a new state, called Novorossija. I have no idea what Mr. Putin had in mind when he used the word "государственность". Then again, Western media has no such idea either. The problem is that the word used by President Putin - "государственности" - does not mean creation of new state or discussion of the statehood for Eastern Ukraine. In fact, it means something entirely different. Google Translate does equate word "государственность" with "statehood". But in the context of scientific and jurisprudential use of the term, "государственность" means "organisation of the structure of state". Here is a link (in Russian) to a Russian text book on "Theory and Legal Aspects of the State" http://y-ra.com/book_problemy-teorii-gosudarstva-i-prava-yurisprudencii_866/18_5.-gosudarstvennost-ponyatie-i-stanovlenie. In this text, there is a clear difference drawn between terms "государствo" and "государственность". Specifically, it says at the very top of the page that: "Если государство представляет собой организацию политиче­ской власти в обществе, то государственность, по существу, олице­творяет глубину, широту и качество проникновения в общество идей и взглядов, освещающих реальную деятельность государст­ва. Государственность - это целостная система идей и взглядов, используемых в организации и деятельности самого государства." Let me attempt to translate this [I preserve Russian punctuation for ease of tracing the text]: "If the state [государство] represents in itself the organisation of the political power system in a society, "государственность" [or 'statehood' in Google translate terms], in essence, embodies depth, spread and quality of development of ideas and views of the real activity of the state in a society. "Государственность" - is a comprehensive system of ideas and views, used in the organisation and operations of the state itself." In other words "государственность" is defined as something that characterises the state, but not the statehood as a formation of distinct state or a new state. The text book goes on to say that: "В процессе формирования государственности в современных условиях принято опираться на общечеловеческие ценности, подхо­дить к характеристике государства как объективно необходимого, культурно-ценностного явления. " Again, translating as well as I can: "In the process of formation of "государственности" in modern conditions it is customary to rely on common human values, approaching characterisation of the state ["государства"] as an objective necessity, cultural and values-based entity." Nothing in the above definition of "государственность" - the term used by Putin - implies a call for independent statehood or for formation of a new state. All of it is consistent with a call for a discussion of what values and systems of a Ukrainian state should look like in Eastern Ukraine. If President Putin wanted to suggest that we need to open the discussion of statehood for Eastern Ukrainian regions, he would have used either term "государствo" - directly translated as "state" or "statehood" - or term "независимость" - directly translated as "independence". I do not claim to know what exactly Mr. Putin has meant by his comment. Nor do I know in which context Mr Putin used the term "государственность" in the context of Eastern Ukraine. But I do know that it is simply wrong to translate his use of word "государственность" as a call to "discuss statehood for Eastern Ukraine". Please note: I have consistently held a view, expressed in numerous posts here and in my media interviews over the span of months since January 2014, that Ukraine is an independent state and should remain such. I said that all parties to the conflict, including Russia, should exercise full respect for Ukraine's territorial integrity, including in Eastern Ukraine and prior to that in Crimea. This view remains. Russia has no business in putting troops in Ukraine and I called before for Russia to seal its borders with Ukraine to any traffic of troops (volunteer or not) and weapons. My point in the above is not to excuse any alleged Russian wrongdoings in the Ukrainian crisis, nor to excuse the separatists actions or support their aspirations. I am simply concerned that we should be very careful in how we interpret statements by Mr Putin and all other leaders. Good news in green, bad news in red. Construction employment grew, which is good news, by 3,600 in 12 months through Q2 2014. Bad news is that Industry employment (ex-Construction) shrunk 2,700 over the same period. Services employment grew by a sizeable 23,800 in 12 months through Q2 2014 and higher value-added sectors employment expanded by 8,300 on Q2 2013. Many jobs have been added in Professional, scientific & technical activities (+6,100) and in Administrative & Support Services (+6,200) both of which also include MNCs trading in ICT services sectors, which is consistent with strong inflows of younger migrants into Ireland recorded in the year through April 2014. Non-agricultural private sector jobs expanded by 21,400 in 12 months through Q2 2014 (up 1.68% y/y) which is a far cry from the Government boisterous claims of 50-60,000 of new jobs being created. Overall across all sectors, the economy added 31,700 jobs on Q2 2013 level (+1.7% y/y). Overall rate of jobs creation has declined significantly in Q2 2014. In Q2 2014, y/y growth in all employment has stood at 1.70%, down from 2.31% growth recorded in Q1 2014 and the slowest rate of jobs growth since Q1 2013. Industry and construction sector jobs growth fell from 1.5% y/y in Q1 2014 to 0.26% in Q2 2014, the slowest rate of jobs growth since the onset of recovery in the sector back in Q2 2013. Services sectors jobs growth also fell to 1.67% in Q2 2014 compared to 1.71% in Q1 2014, and currently stands at the slowest rate of growth in 3 quarters. Non-agricultural private sector jobs growth in Q2 2014 was 1.68%, down from 2.18% in Q1 2014 and the slowest rate since Q2 2013. 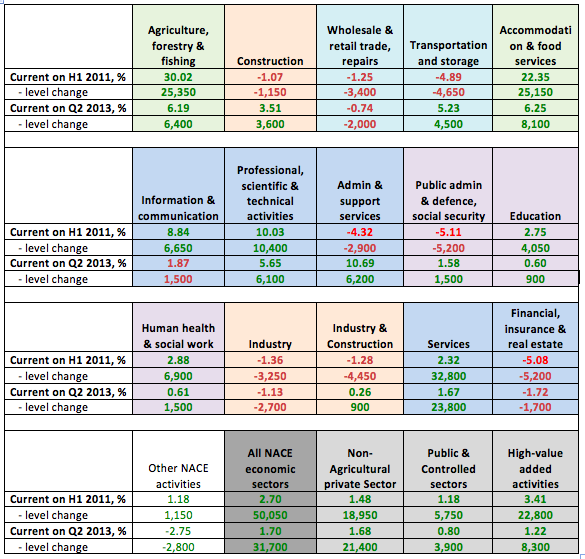 High value-added sectors jobs growth is down to 1.22% in Q2 2014, the lowest reading in any quarter since Q3 2012. 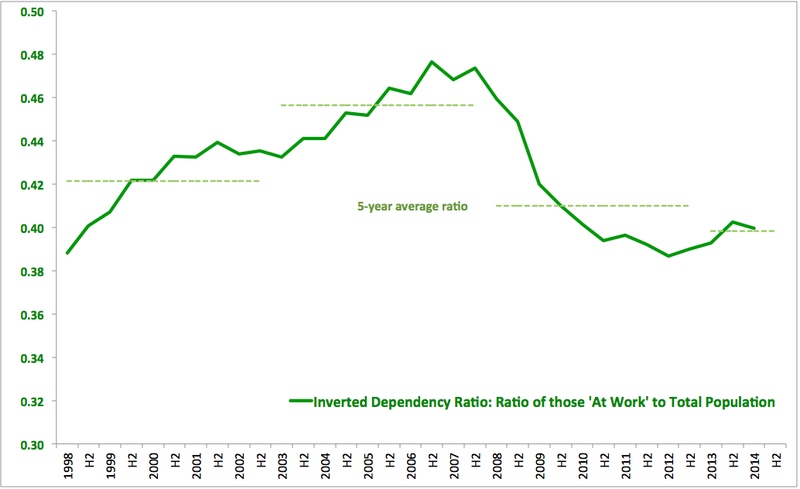 In the present post, a quick summary of changes in overall dependency ratio. I define a ratio of those at work to total population. This is imprecise as we only have estimated population figures for the year, and year coverage is for 12 months through April each year. The data is directionally-indicative more than actual levels, so many caveats here. However it does show where this economy is heading in terms of how many people support via work the rest of the population. In H1 2014, the ratio of those at work to total population declined to 0.3997 from 0.4026 in H2 2013 and up on 0.3927 in H2 2013. This is less material than the fact that current average (from H1 2013 through H1 2014) is running at 0.3983 - the lowest for any 5 year period on record. In simple terms, there are fewer people supporting through work larger number of those who do not work for any reason. Total number of individuals of age 15 and above residing in Ireland decreased from 3,596,500 in Q1 2014 to 3,593,900 in Q2 2014 a drop of 0.14% on Q1 2011 when the current Coalition Government came to power, following a 0.07% decline recorded in Q1 2014. Year-on-year, the number of residents that are economically active or potentially active was up 0.21%. Numbers of unemployed fell to 298,100 in Q2 2014, marking a y/y decline of 9.67% and the first quarter since Q1 2009 that the numbers of unemployed fell below 300,000. However, rate of decline (y/y) in Q2 2014 was lower than in Q1 2014 when the levels of unemployment dropped by 10.43%. All together, these are healthy numbers, with current numbers of unemployed 18.49% below those recorded in Q1 2011. Student numbers fell 0.89% y/y in Q2 2014, slightly slower rate of contraction than recorded in Q1 2014 (-1.26%). Numbers of those engaged at home rose from 476,100 in Q1 2014 to 478,100 in Q2 2014, but are down y/y some 1.77% and are down on Q1 2011 by 9.83%. Numbers of those retired from employment stood at 410,500 in Q2 2014, up on 407,200 in Q1 2014 and up 1.61% y/y. The numbers of retirees are up 17.86 on Q1 2011 and there is a distinct pattern of higher levels of retirees in the economy since the onset of the crisis (see chart below). Prior to the crisis, numbers of retired in the economy were averaging around 300,300 in 2007. In last 12 months these averaged 402,300. 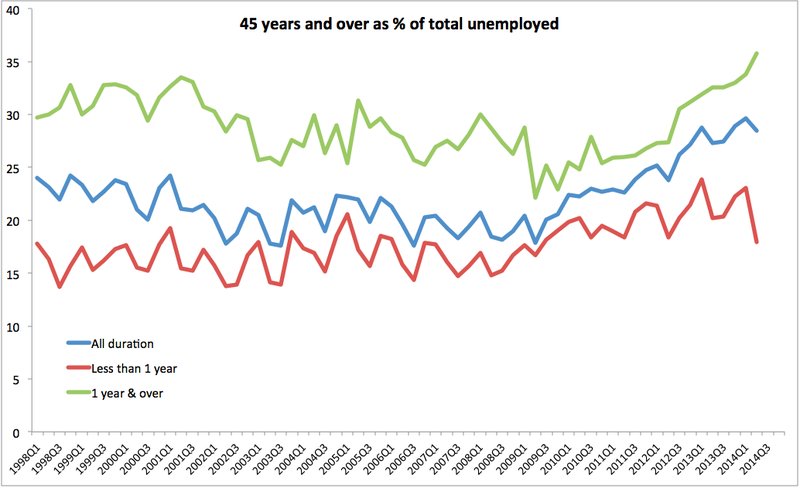 Retired persons are not counted as unemployed, even if they took early retirement and are available for work, so early retirement schemes deployed in the public sector on a grand scale in recent years are de facto schemes that superficially reduced unemployment, while increasing real dependency ratios in the economy as a whole. 'Other' category - capturing those who are not unemployed officially and do not work for reasons other than being students, being engaged at home or retired - rose from 150,500 in Q1 2014 to 152,800 in Q2 2014. However, y/y their numbers dropped 2.21% but Q2 2014 figures were up 1.26% on Q1 2011. There is a similar problem here as the one evident in the case of the retired cohort: in 2007, numbers of those falling into 'other' category were running at an average of 129,100. In the last 12 months period they averaged 152,100 - a rise of 23,000. 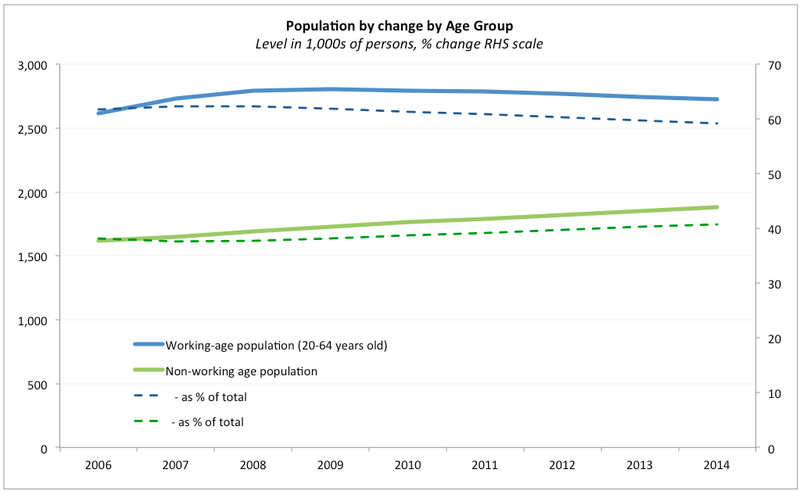 Together, average 12 month period increases in retired persons and 'others' compared to 2007 are around 130,000. 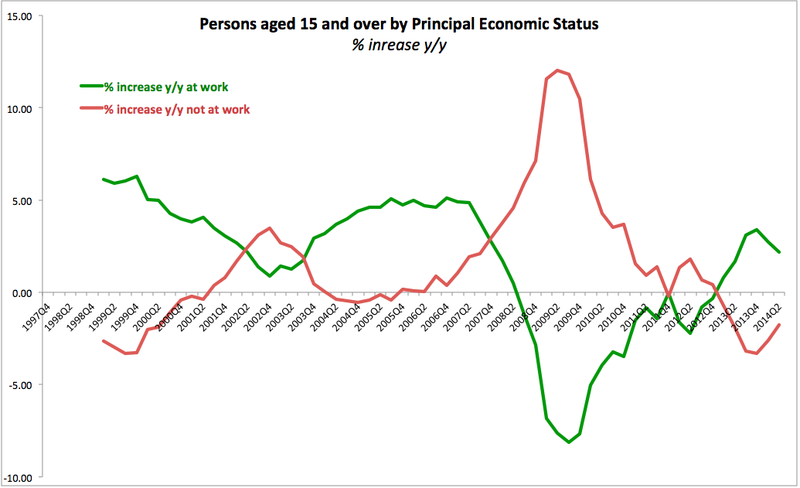 Good news: proportion of those classified as being at work as percent of total population of age 15 and older rose in Q2 2014 to 51.27% from 51.0% in Q1 2014 and compared to Q2 2013 when it stood at 50.29%. H1 2014 average is now at 51.14% which is higher than the proportion of those at work recorded in H1 2011-2013. Proportion of those not at work fell to 48.86% in H1 2014 from 50.02% in H1 2013. Which is also good news. 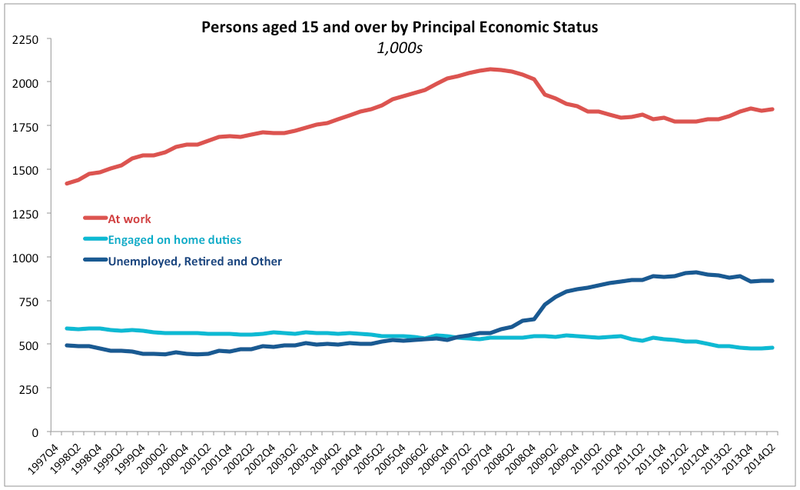 But, consistent with the earlier mentioned trend, proportion of those in retirement rose to 15.59% in H1 2014 from 15.34% in H1 2013 and is now at its highest level since the records began in Q1 1998. As the result of the above, numbers of unemployed, retired and 'other' fell 19,500 in 12 months through Q2 2014. In the previous post, I covered duration of unemployment across age cohorts data for Q2 2014. This time around, let's take a look at labour force participation rates and unemployment rates. As noted earlier, there are some good news in the latest QNHS data. 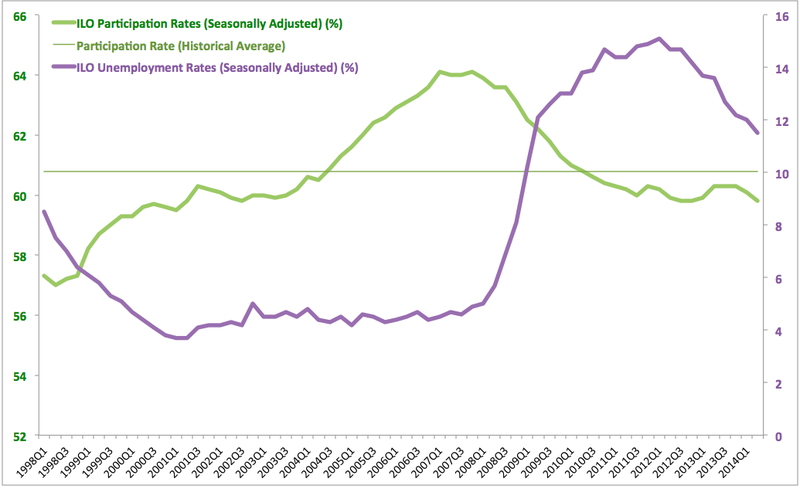 And this theme continues with unemployment rate statistics. Official unemployment rate has declined from 12% in Q1 2014 to 11.5% in Q2 2014 (seasonally-adjusted basis). Thus, Q/Q unemployment rate dropped by a substantial 0.5 percentage points, which is faster than the 0.2%points decline in Q1 2014 compared to Q4 2013. It is worth noting that in Q2 2013, Q/Q decline in seasonally-adjusted unemployment rate was shallower 0.1 percentage points. Overall, over H1 2014, unemployment rate declined by 0.7 percentage points compared to the end of 2013. Over the same period of 2013, decline was 0.6 percentage points. Without seasonal adjustment, things are slightly different. Y/Y Q2 2014 unemployment rate is down 2.1 percentage points and in Q1 2014 the same decline was 1.7 percentage points. These rates are faster than the rates of y/y declines in unemployment for the same period of 2013. Things are not as good on the participation rates front, however. Non-seasonally-adjusted Participation Rate fell from 60.5 in Q2 2013 to 60.0 in Q2 2014. H1 2014 average participation rate was 59.85 against H1 2013 average of 60.0, H1 2012 average of 59.9 and H1 2011 average of 60.1, in H1 2010 the average was 60.8, in H1 2009 it was 62.2 and so on... Q2 2014 participation rate was lower than Q2 2011 reading of 60.5. By all metrics, participation rate has fallen and not just y/y, but also compared to other periods of the crisis. On seasonally-adjusted basis, Participation Rate also fell, from 60.1 in Q1 2014 to 59.8 in Q2 2014. This marks the lowest Q2 participation rate since Q2 2000. Last time seasonally-adjusted participation rate expanded in Ireland was in Q2 2013. As chart above illustrates, the bad news is that participation rate is not growing and is basically flat since Q2 2011. 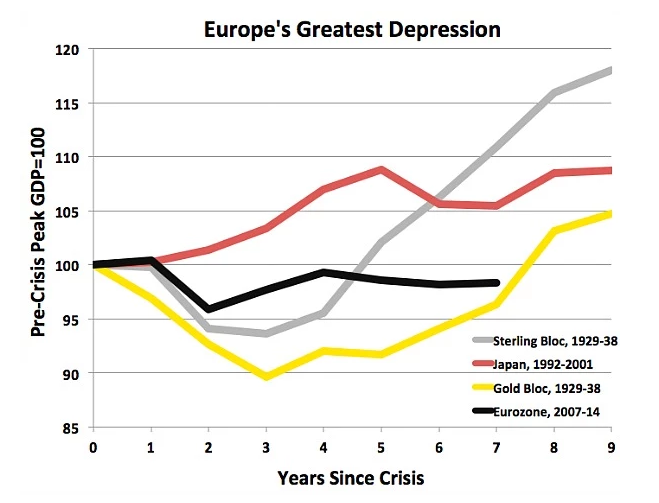 Worse news is that it is now matching the crisis period low. Even worse things is that the participation rate is running below historical trend in every quarter since Q2 2010. Guess those higher taxes, as well as high cost of childcare for families, are keeping people out of the labour force (remember, labour force includes employed and unemployed workers who are searching for a job). Or by definition: The labour force participation rate is computed as an expression of the number of persons in the labour force as a percentage of the working age population. The labour force is the sum of the number of persons employed and of persons unemployed. So in basic terms, of every ten persons of working age, six are either employed or unemployed, and four are neither working nor seeking a job. At the peak of the Celtic Tiger, the ratio was 6.4 to 3.6. Two tables below summarise y/y and current on Q1 2011 (tenure of the present Coalition Government) changes in unemployment by age groups and duration of unemployment. Overall unemployment declined. This is good news, albeit not very new nor very interesting. Y/y there were more significant declines in long-term unemployment for all those in the labour force (year on year, down 16.3% for those unemployed 1 year and over as opposed to a decline of 15.4% for those in unemployment in general). There were comparable declines in unemployment compared to Q1 2011 for those in long-term unemployment (down 17.2%) as for all unemployed (down 17.3%). Caveat to (2) and (3) above: while these are good numbers, longer term unemployment declines are more heavily influenced by drop outs from the workforce than other durations. In year-on-year terms, 15-24 years old have performed significantly better than average in terms of declines in unemployment of any duration and somewhat better than average in terms of declines in long-term unemployment. This suggests that some component of the current younger long-term unemployed is still structural - and cannot be easily removed by switching them into either education, training or into new jobs. Younger long-term unemployed also performed better than average for their reference group in terms of current levels compared to Q1 2011. 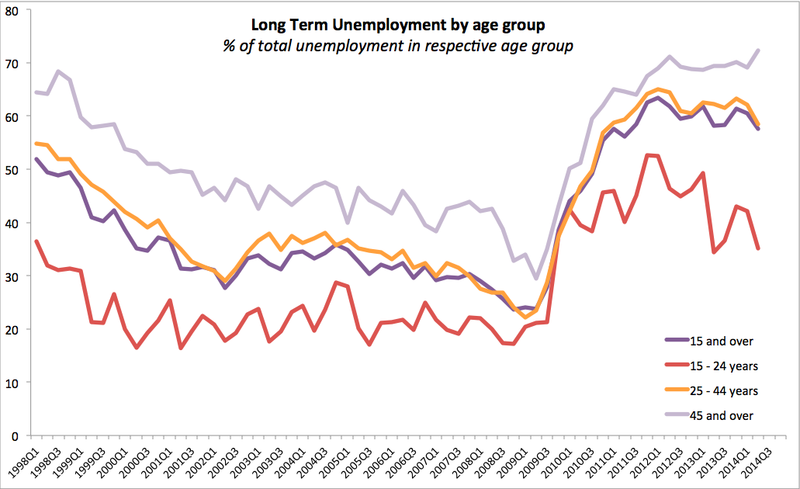 This suggests that there have been some successes in shifting younger people off unemployment and longer-term unemployment too. Which is good news. In year-on-year terms, mid-age group of long-term unemployed outperformed the average in terms of declines in unemployment (-20.9% against -16.3% average). But overall declines in unemployment in this group are basically around average (-15.8% against -15.4% for the overall group). 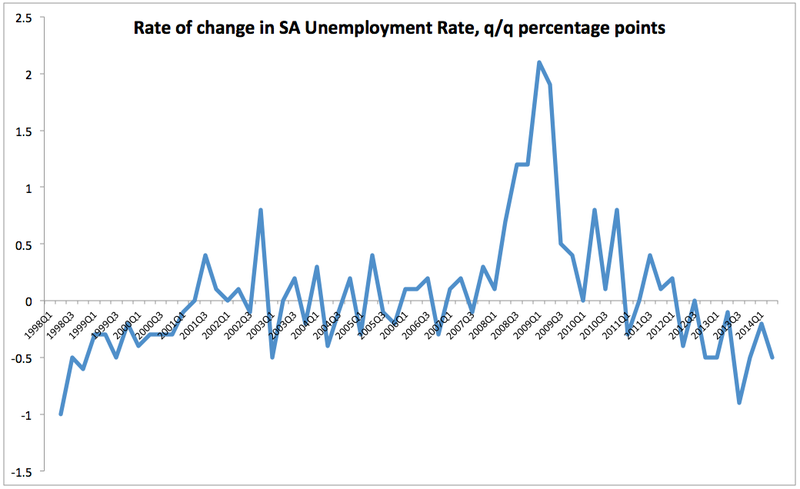 Things are better for this category of workers both in short and long-term unemployment when compared to Q1 2011. Again, this is good news. Bad news are for the category of workers 45 years of age and over. Why? In year-on-year terms, their unemployment rates declined less than across all age categories (-11.8% for all 45+ years of age against -15.4% for all workers) and in comparison to Q1 2011, their unemployment levels are higher (+2.7% for all 45+ years of age against -17.3% for all workers). Even worse news are for the long-term unemployed workers of age 45 and over: their unemployment rates declined much less than across all age categories (-8.1% for all 45+ years of age against -16.3% for all workers) and in comparison to Q1 2011, their unemployment levels are significantly higher (+14.4% for all 45+ years of age against -17.2% for all workers). This is the bad news: older workers are becoming increasingly less and less employable and the jobs being created in the economy, as well as training and activation schemes made available by the state are not working for this group. The problem of long-term unemployment is bad enough - unemployment of duration in excess of 6-12 months has very long-term effect on employability of the workers, their skills, their psychological well-being, but also permanent effect on their wages and the probability of future jobs losses spells, and so on. 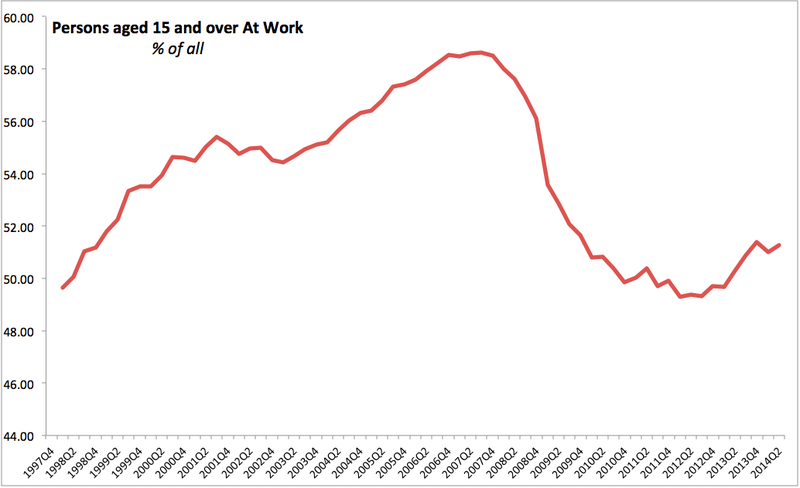 The problem of long-term older workers is worse. Workers left without the job for a year or so, whilst in their older age are facing much greater barrier to re-entry into the workforce and suffer much more significant losses to their pensions, health status and social standing than their younger counterparts. They are also much harder to re-train and up-skill, so activation programmes generally designed to deal with the acute unemployment crises are not suitable for their needs. Stay tuned for more analysis of QNHS figures. 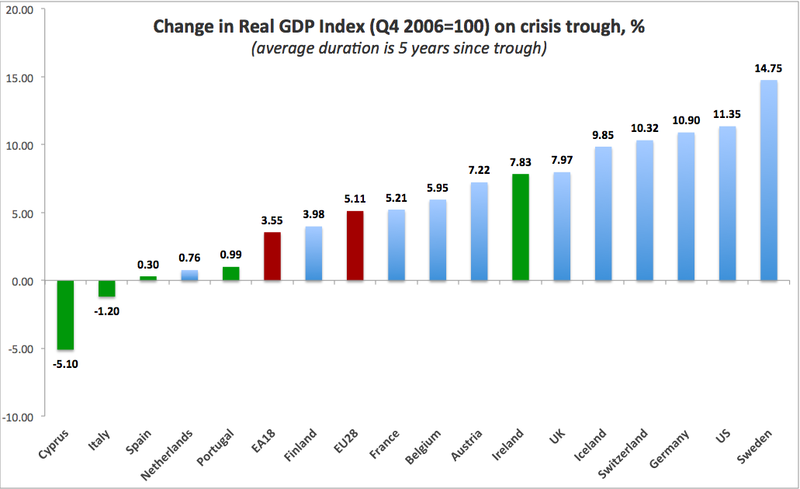 It has been 6.5 years since euro GDP been below pre-crisis levels. And things are getting worse, not better as we speak. Remember, this is supposedly the European Century, per comfortably overpaid outgoing EU Commission. This is the Age of Europe, per majority of the comfortably overpaid incoming EU Commission. This is the state of delusion. When America sneezes, Europe catches a cold… These days, America is more pointing than sneezing, and Europe is heading for the bite rather than a cold. The bite of sanctions against Russia. In my view, the damage can be heavy. And this was based on the US proposals being aired around to ban Russian banks' access to short-term funding and derivatives markets. Today, the UK joined the chorus of 'throw Russian financial system into the dark ages'. Let's start from the latter. The UK is planning to push EU leaders to ban Russian access to the Society for Worldwide Interbank Financial Telecommunication system, commonly known as SWIFT. If SWIFT access for Russian banks is interrupted, the impact will be big. Cross-border banking will become excruciatingly expensive and limited for Russian companies and banks, including all companies and banks - whether sanctioned explicitly, or left off the list of sanctions to-date. Trade flows and payments will be disrupted too. Russia has been preparing for this already, having announced back on August 7 that it is working on creation of the domestic system for banks transfers and data transmissions. Swift is a 'worldwide' system because it is used worldwide, covering 215 countries, but the company is incorporated under the Belgian law and as such is a hostage to the EU, which did block Iranian banks' access to the system back in 2012. This raises a major point for the stability of the global financial system: a major technical part of it is a de facto subject to the political choices of the EU. The system can create a new competitor to SWIFT - a competitor outside the regulatory net of the Western authorities. Meanwhile, the US is pouring over its own 'solutions'. As was reported earlier this week, the US is looking into limiting derivatives trading (including commodities options and futures, plus currency derivatives) and short-term loans for Russian corporates and banks. So far, sanctions have impacted only longer-term debt issuance by the companies listed explicitly on the sanctions list, but also cooled off other Russian corporates' access to the US and European debt markets, despite them not being on the list. Bloomberg reported earlier this week that Russian companies placed only USD4.1 billion of bonds abroad since mid-March 2014, which is less than a fifth of issuance in the same period last year. Combined, the two approaches will impose a significant cost onto Russian economy. More importantly, the measures will disrupt legitimate, non-sanctioned (to-date) ordinary day-to-day business conducted by Russian companies. They will also put pressure on Russian funds outside the country, including ordinary savings, small business funds and investments. The sanctions, if passed, will have to be matched by Russia, and it is very hard to imagine what the co-measurable response can be. 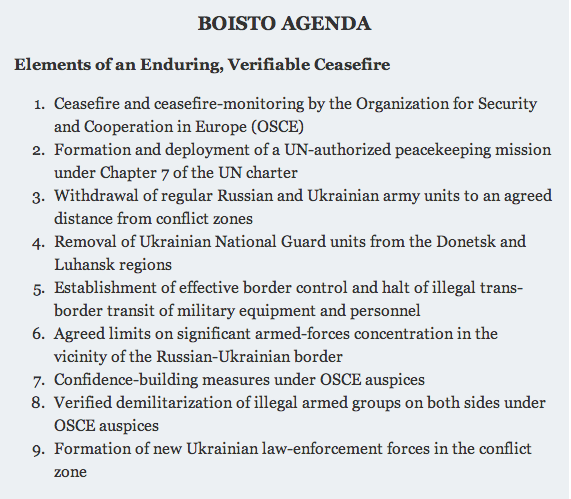 Russia's security in the face of encroaching Nato - including the 2002 Nato-Ukraine Action Plan, the 2005 Intensified Dialogue, the 2008 Bucharest declaration that effectively invited Ukraine to join Nato "when it wants to join and meets the criteria for accession"and so on - all temporally pre-dating December 2013. The failed state of Ukraine. I am not going to expand extensively on any of the above points, let the historians deal with them, but it is clear that none of them have anything to do with economic conditions in Russia. However, all of them are being only reinforced by the sense of political and popular consolidation that is sweeping across Russia today, triggered in part by the sanctions. The current leadership of Russia is actually being helped, not harmed by the sanctions precisely because their imposition and acceleration continue to remind ordinary Russian people that points (1) and (2) are valid. 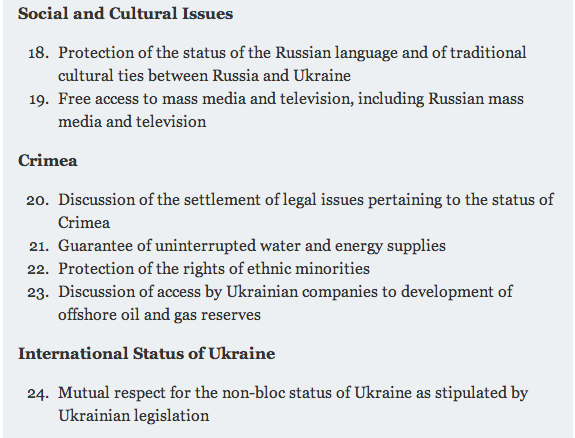 They need no reminder that point 3 is valid as millions of Ukrainians work in Russia, trying to make some sort of a future that is simply infeasible in Ukraine itself. In a nutshell, anyone who knows Russian history also knows that Russian culture, history, social institutions - all rest on the foundations of securing unity in adversity. The more adversity you throw Russian way, the greater consolidation the Russian system will achieve. Time to smell the roses, folks. The West will not [rightly] put its own boys-in-uniforms into Ukraine to protect the Maidan Government. The West [for want of funds and will] will hardly even pay the cost of rebuilding the Ukraine. The West [for lack of capability absent any serious Federalist reforms in the country] is not going to create a functional state out of the failed one. Ukraine is not Latvia or Estonia. Expecting a functional democracy to emerge in a large state fragmented by linguistic, ethnic, cultural, historical and social divisions of the magnitude that prevail across the Ukraine without some sort of a Federal state not anchored in chauvinistic nationalism exercised by either side is naive. Iraq is a model here, not Czechoslovakia. Russian Economy Ministry updated its 2014-2015 economic forecasts. 2014 forecast for real GDP growth remains at 0.5%, a notch below 0.6% forecast by the Central Bank. The ministry lowered forecast for 2015 to 1%, from 2% previously. Notably, the Ministry did not raise its GDP growth forecast for 2014, despite numerous recent comments by Ministry officials that they expect 2014 GDP to come in at closer to 1% growth. Updated inflation forecast is for 7-7.5% y/y in 2014. This reflects an uplift of 1-1.5% on previous forecast (6%) and is 1.5-2% above the official CBR target. CBR own forecast is for 6% for 2014. Revisions in inflation forecast are down to impact of imports bans on food which is expected to add 1% to the inflation rate in 2014 and 0.5% in 2015. Furthermore, sales tax introduction in 2015 (on top of 18% VAT already in place) will add another 1% to inflation. Ministry 2015 forecast for inflation is now at 6-7% which is an increase of 1-2% on 6% forecast issued previously. CBR target for 2015 was 4.5%. Analysts consensus forecast is for 0.3% GDP growth and inflation of 6.5% in 2014. The latest forecasts from the Ministry suggest that there will be serious revisions to the Budget for 2015. Growth in retail sales for 2015 is forecast to fall to 0.5% (latest growth of around 1%), while fixed investments is forecast to increase by 1.5% (current rate is -2%). Ministry projects a nearly 8% drop in Russia’s imports this year, in line with 'normal' Russian economy's reaction to a growth slowdown and in a clear response in capital imports demand to higher CBR rates. Investment is forecast to return to growth of less than 1% in 2015. August the €-coin - a lead growth indicator for euro area GDP - fell to 0.19 from 0.27 in July, continuing the trend that began last spring. Per CEPR and Banca d'Italia release, "The decline of the indicator reflects the weakening of economic activity in the second quarter and the recent worsening of consumer and business confidence, although the flattening of the interest rate curve made a slightly positive contribution." This comes as further bad news for the euro area that has been posting some pretty awful macro data for some months now. Eurocoin latest decline is marks the fourth consecutive month of no growth in the indicator. The stock market performance component of the indicator is holding it above the zero line, but August reading is no longer statistically distinguishable from zero growth. Once stock markets effects fizzle out, there will be little left to support indicator. In Q1 2014, the eurocoin indicator averaged 0.35 against actual GDP growth coming at 0.2%, in Q2 2014, the indicator averaged 0.34 and actual growth came in at 0.0%. So far in Q3 2014 we have two months-average of 0.23, suggesting that factoring out stock and bonds markets / interest rates performance from the indicator we have negative growth closer to -0.05-0.1%. Inflationary signals are also weak: August data we have so far shows German inflation at 0.8%, Spanish at -0.5%, Belgian at 0% and Slovenian at 0%. Update: Euro area flash estimate for inflation is now down to 0.3% from 0.4% in August weighted down by energy costs and food. Q: Can we talk of a “change” in the mood regarding austerity policies after the Draghi’s Jackson Hole speech – too little is worse than too much? A: Mario Draghi's speech at Jackson Hole was significant for a number of reasons. Firstly, it is an important signal of the ongoing gradual re-orientation of the ECB attention away from technical inflation targeting toward more detailed consideration of the inflation-leading fundamentals. Technical targeting is still there, but the focus is moving toward the real economy. This is a signal that reinforces, tacitly, previous policy bases, especially the concept behind the TLTROs as opposed to traditional LTROs, as well as the structured asset purchases programme currently in design. Secondly, the speech clearly signalled the ECB's return to direct opposition to the EU-led structural reforms policies. Specifically, Darghi's focus on unemployment signals growing frustration within the ECB that structural reforms are not working due to their poor implementation, unambitious design and for cyclical reasons. While the media opted to focus on the latter point, dealing with the issues of cyclical timing, and thus with 'austerity' policies, in my view, longer term perspective inherent in Mr Draghi's emphasis on unemployment warrants the view that the ECB is once again moving to pressure Euro area leaders to stay the course of reforms over the long run, even if temporarily opening the door to easing the pressures of reforms in the immediate future. The above two points are very clear from Mr. Draghi's discussion of structural vs cyclical economic impacts of the Great Recession. Thirdly, it is also clear that Mr. Draghi is positioning ECB closer and closer to deploying an outright large scale quantitative easing (QE). However, he is painfully aware of the fact that traditional QE will risk pushing Euro area sovereigns further away from the necessity to enact painful reforms and that political cycle is starting to reinforce misdirected economic incentives. Furthermore, he is aware that current yields on Government bonds are not only benign, but outright exuberantly optimistic. Thus, the issue, in Mr. Draghi's view, is not how much QE is needed, but rather of what type - a choice being between the traditional QE (sovereign channel), LTROs-based QE (banking channel), asset buying and TLTRO (private supply side channel) or deleveraging supports (private demand side channel). 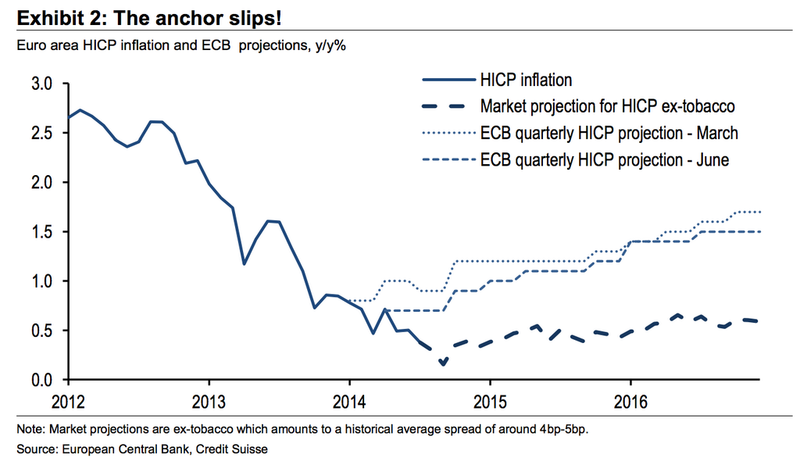 The problem with ECB's current stance is exactly that its policy innovations so far ignored the last channel which represents most direct route to stimulating demand and investment, and are yet to specify the penultimate channel which represents direct route to a supply side stimulus. 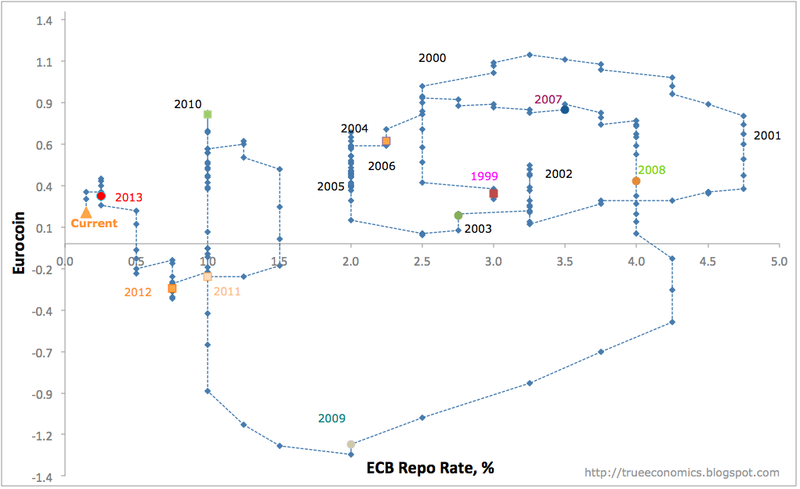 On the balance, Mr. Draghi's speech was far from being 'too little', although it still might be 'too late'. He touched the most important issue bridging supply and demand sides of the economy - employment - but as he notes, structural dimension of unemployment in Europe makes it very hard for the ECB to enact a traditional set of policy tools suitable more for reducing cyclical unemployment. Russian economy is showing signs of stress, both in structural terms and in terms of the fallout from the Ukraine crisis. In structural terms, reforms of 2004-2007 period now appear to be firmly shelved and are unlikely to be revived until the sanctions are lifted and some sort of trade and investment normalization takes place. Structural weaknesses will, therefore, remain in place. In dealing with the crisis fallout, even if Russia were to switch to self-sufficiency in food production and tech supplies for defense sector and oil & gas sector, as well as re-gear its corporate borrowings toward Asia-Pacific markets, the reduced efficiencies due to curtailed trade and specialisation are likely to weigh on the economy. There is absolutely no gain to be had from switching the economy toward an autarky. Politics aside, it is imperative from economic point of view that Russia starts to make active steps to disentangle itself from Ukrainian crisis. Rebuilding trade and investment relations with the West and Ukraine – both very important objectives for the medium term for Russia – will take a long, long time. It’s best to hit the road sooner than later. Please note: this is not a note designed to deal with geopolitical crisis unfolding in Ukraine or Russia's role in the crisis. Here, I deal with economics. Irish residential properties price index for July was released by CSO. 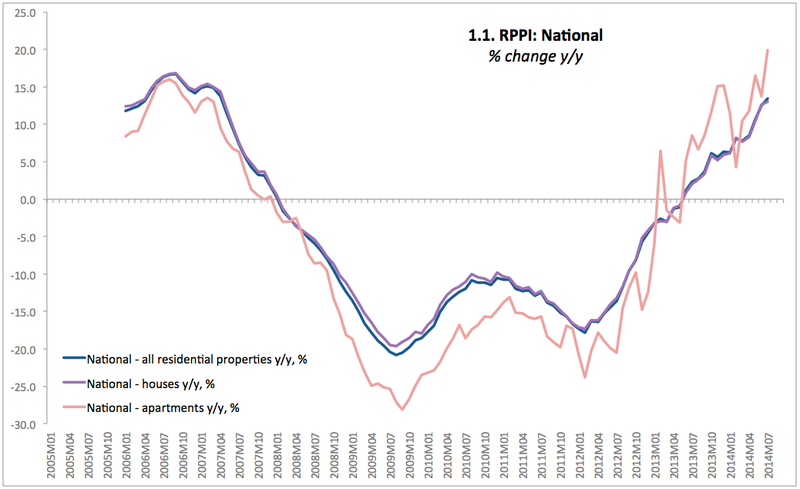 The data is showing continued established trends in prices recovery with further amplification in the worrying trends of double-digit y/y increases in Dublin property prices. While I generally prefer to provide more detailed analysis on a quarterly data, which will be available at the end of October, the current rates of increases in prices are now worrying and deserve at least a brief comment. Overall, National Residential Prices Index rose to 75.3 in July 2014, which is up 13.4% y/y. July marks third consecutive month of double-digit y/y increases in prices. And the rate of increases is accelerating for the fourth consecutive month. This is worrying. The level of index remains low - 42.3% off its pre-crisis peak and only 17.47% up on crisis trough. 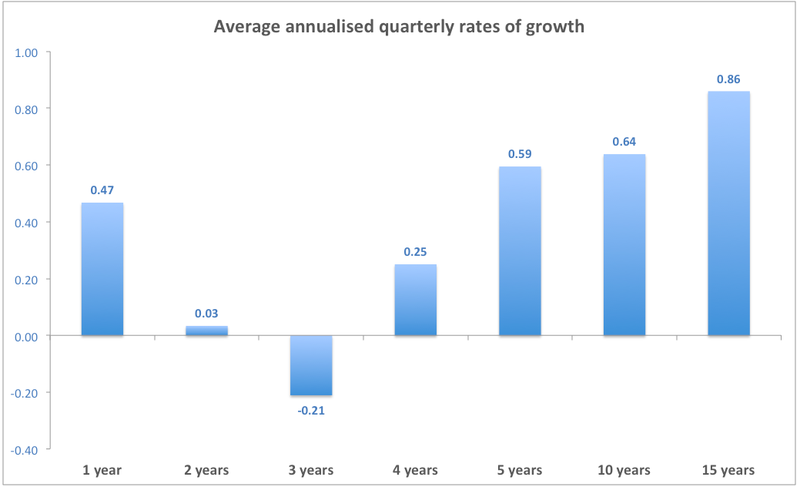 But cumulated 24 months gain is now 16.0% (an annualised rate of increases at 7.71%). Thus, as I noted before, the main concern is not the level of prices, yet, but the the rate at which prices are moving up. Furthermore, the rate of price increases in the Apartments segment of the market is clearly outstripping price increases for houses in all months since June 2013, with exception of February 2014. 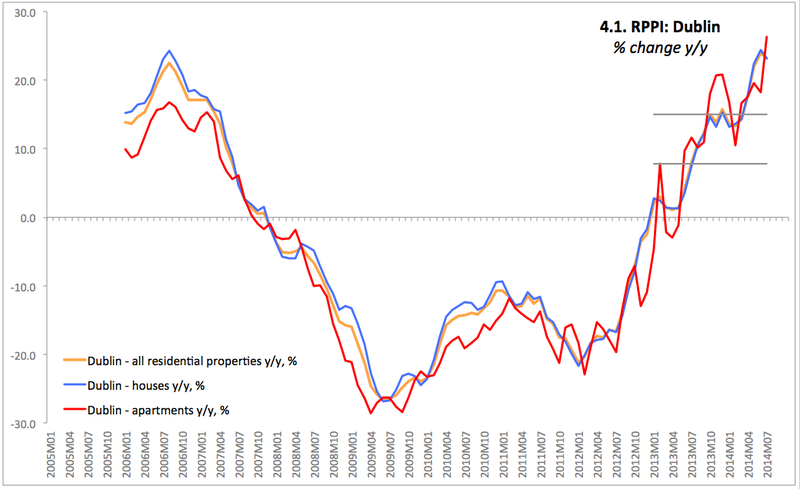 This too is worrying as this suggests investment motives buying acting strongly to push prices up for rental properties. The result will likely be misallocation of investment and rising rents. In Dublin, the growth rates are even of greater concern. Once again, levels are not a problem: Dublin residential properties index currently sits at 76.6 which is 43.5% lower than pre-crisis peak and 33.68% higher than crisis period trough. Dublin fell hardest and fastest of all markets in Ireland during the crisis, so it is bouncing back now faster too. So much is fine. But the rates of increase in prices y/y are now running at double digits for 12 consecutive months in a row, with last three months the rates of prices increases in Dublin at above 21 percent. sooner or later it will be time to call this a 'feeding frenzy' and if the credit supply to the sector were to improve, all stops will be pulled out of the buyers. Psychology here is not pretty. are all adding up to a rising pressure on the investors and buyers to go into the market to secure 'any' deal at 'any' valuation as long as it is remotely affordable. Now, as promised earlier, lets take a look at the decomposition of the migration data. Total emigration from Ireland in 12 months through April 2014 stood at 81,900, which is down from 89,000 in the same period 2013 (a decline of 7,100). This marks the first year of decrease in emigration since 2011. 40,700 Irish nationals emigrated from Ireland in 12 months through April 2014, down 10,200 on the same period of 2013 and marking the first slowdown in outflows since 2008. Latest rate of emigration for Irish nationals is the lowest reading since 2010. Over the 12 months though April 2014, 2,700 UK nationals emigrated from Ireland - which represents a decline in emigration rate for this group of residents of 1,200 y/y. However, this decline was more than off-set by the rise in emigration of 'Rest of EU-15' residents which rose 4,100 y/y to 14,000 in the 12 months through April 2014. The rate of emigration from Ireland for EU12 Accession states nationals slowed down from 14,000 in 12 months through April 2013 to 10,100 in 12 months through April 2014. For non-EU nationals, the rate of emigration has accelerated to 14,400 in the 12 months through April 2014 from 10,300 in the same period of 2013. Thus, for the fifth year in a row, Irish nationals represented the largest group of emigrants from Ireland by total numbers. However, if in 2011-2013 Irish nationals represented more than 50% of the total emigration numbers, in 2014 this fell to 49.7%. 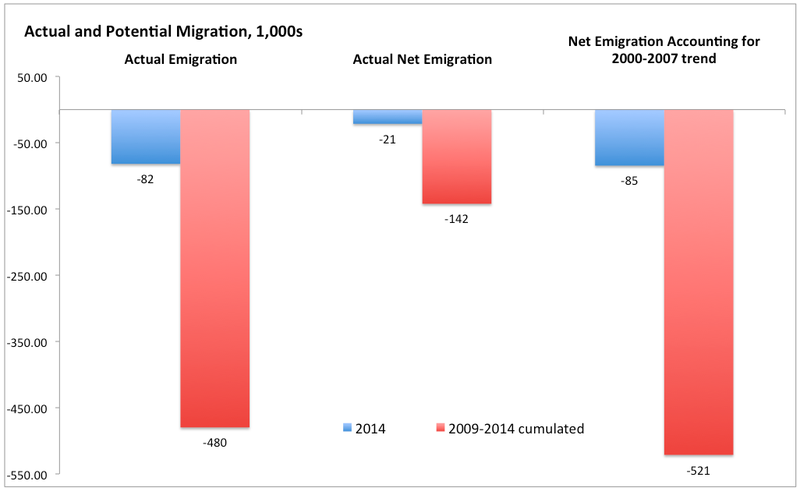 Net emigration figures, however, were less encouraging for the Irish nationals. Total net emigration from Ireland stood at 21,400 in 12 months through April 2014, down from 33,100 in April 2013. Irish nationals' net emigration rate was running at 29,200 in the 12 months through April 2014, down from 35,200 in 2013, but still above the rate recorded for any other year since 2006. In contrast with the trend for the Irish nationals, UK nationals posted another year of rising net immigration into Ireland: 2,200 more UK nationals now reside in the country compared 1,000 more in 2013. 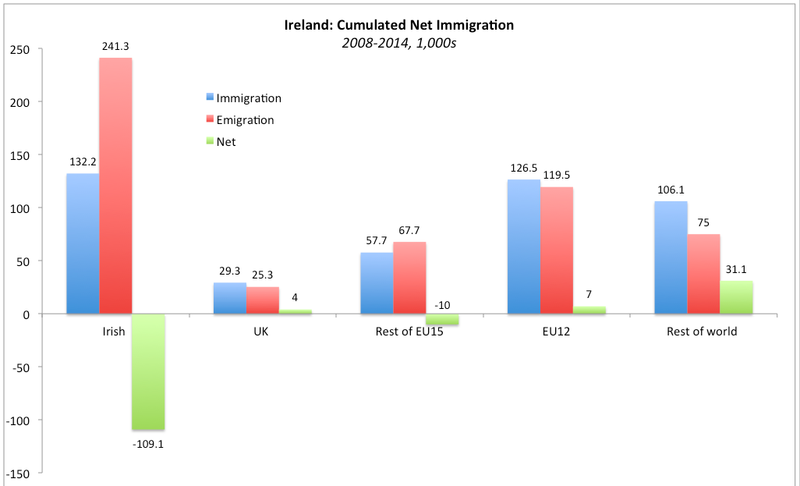 Rest of EU-15 group posted an increase in the rate of net emigration from Ireland in 2014 (-5,300) compared to 2013 (-2,500). This made 2014 the worst year for net emigration of this group out of Ireland on record. Net emigration of the EU12 Accession states nationals fell to its lowest crisis-period level of 200 in 2014, down from 3,200 in 2013. Non-EU nationals recorded net immigration rate of 11,200 in 2014 which represents the highest rate on record (since 2006). Population and migration estimates for the 12 months period through April 2014 have been finally released by the CSO with a lag of some 4 months. The figures show some marginal improvement in the underlying trends compared to the disastrous 2013, but overall the situation remains bleak. Let's start with top level figures first and deal with compositional details in the subsequent post. Births numbers have fallen to the levels last seen in 2007, from 70,500 in 2013 to 67,700 in 2014. Improving labour market and deteriorating personal finances are more likely behind the trend: the former means lower incentives to stay out of labour market and lower incentives to take maternity leave protection, while the latter means increased pressure to generate second income in the family, which is, of course, automatically associated with having to pay extortionate childcare costs. Whatever the drivers are, this is the births rate peaked in 2010 and has been declining since, neatly tracing out labour markets developments. 2014 marks the first year since 2007 that the rate is below 70,000. Deaths are running at the rate proximate to 2013 and not far off from 2012. This means that the Natural Increase in population has slowed down to 37,900 in 2014 from 40,800 in 2013 and this marks the lowest natural rate of increase since 2006 and the first sub-40,000 rate of increase since 2007. Immigration rose in 12 months through April 2014 to 60,600 from 55,900 in the 12 months through April 2013. 2014 figure is the highest since 2009. 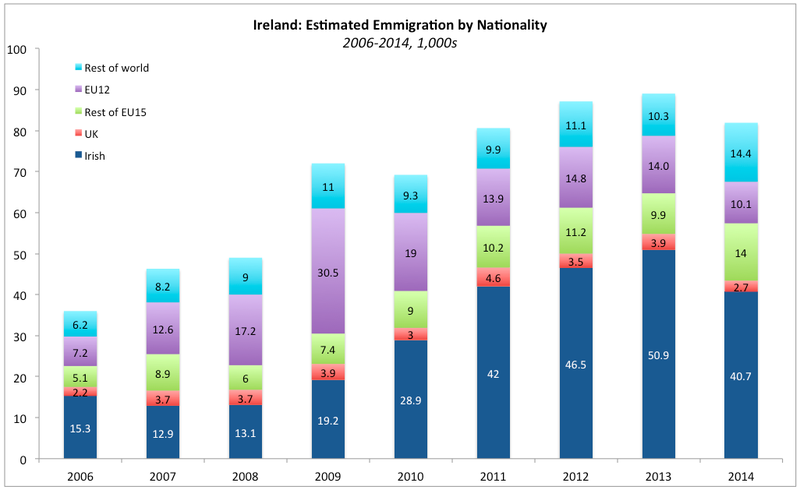 Emigration declined to 81,900 in 2014 against 89,000 in 2013. This is the lowest level of emigration since 2011 when outflow of migrants from the country was running at 80,600. Net emigration also moderated in 12 months through April 2014, declining from 2013 level of 33,100 to 2014 figure of 21,400. This marks the lowest net emigration rate for the entire crisis period. Which is, undoubtedly, good news. Bad news, we are still in net emigration mode. With slower rate of net emigration outflows, net change in Irish resident population was positive in 12 months through April 2014, recording an increase of 16,500 y/y, compared to 7,700 rise in 12 months through April 2013. Meanwhile, cumulated 2009-2014 emigration amounted to 479,800, cumulated net emigration for the same period amounted to 142,200. These are actual figures recorded. 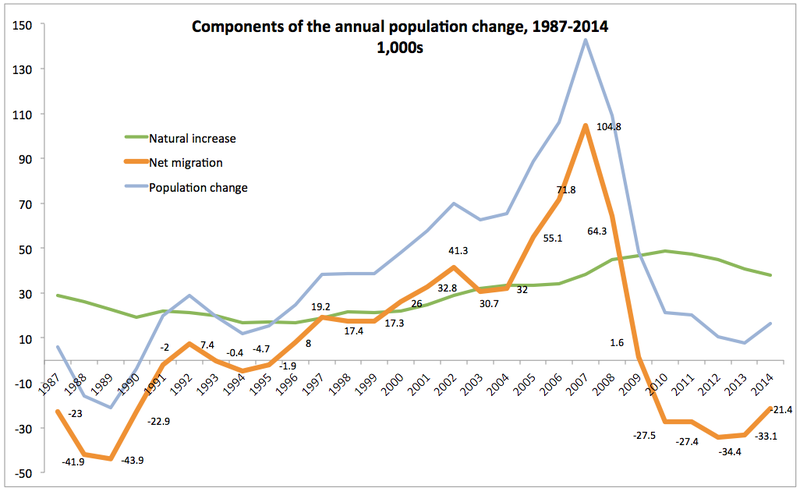 Taking into the account the trends in Irish migration over 2000-2007 period, the 'opportunity cost' of the crisis is the *net* loss of some 521,000 residents relative to where the population could have been were the trends established in 2000-2007 to remain in place. 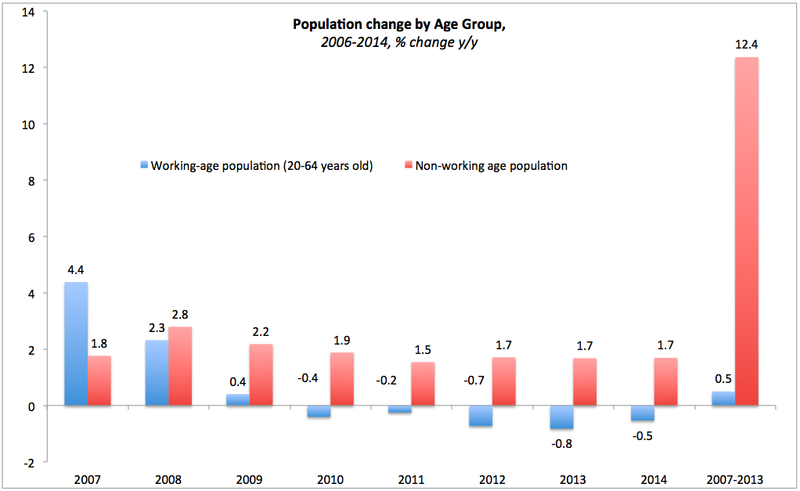 Working-age (20-64 year olds) population stood at 2,728,300 as of the end of April 2014, down 14,500 on a year ago and down 64,200 on 2008. As percentage of the total population, working-age population is now standing at 59.2%, the lowest for any period since 2006. Non-working age population is up 31,300 to 1,881,600 in 2014 compared to 2013 and up 188,900 on 2008. Non-working age population now stands at 40.8%, up on 40.3% in 2013 and the highest for any period since 2006. These haven't been slow-days-of-summer on the Irish corporate tax reputation front. 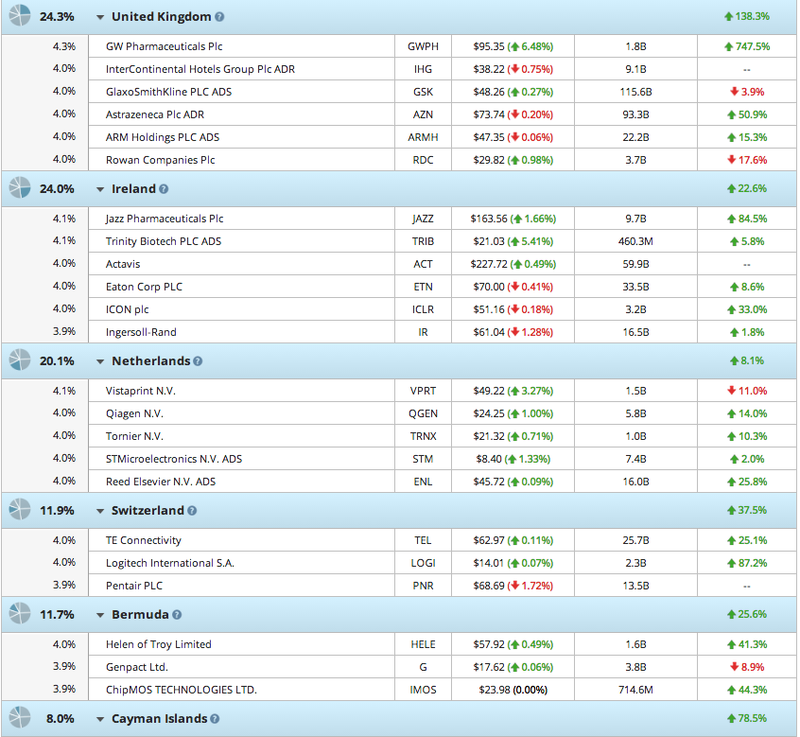 These folks should list on Irish Stock Exchange... oh, poor Bermuda and Bahamas, obviously lacking in that skills-and-talent competitiveness we have so much of. 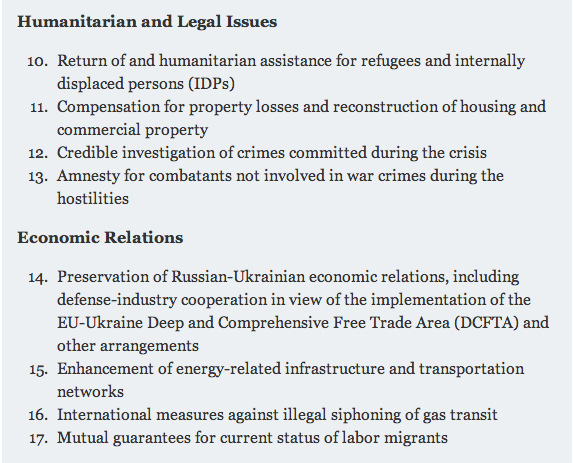 There are several major roadblocks for devising and implementing a functional road map to deliver peaceful de-escalation and ultimately resolution of the conflict in the Ukraine. Some are quite directly logistical (this does not make them any less important, although this does imply different approach to dealing with them). But some are policy-related. One of the more frustrating aspects of the conflict to-date is the apparent lack of understanding and bridging between Russian position, Ukrainian position and the Western position. The three positions differ both on the desired objectives and the potential means for achieving them. To-date, there has been no credible or functional plan to bridge the gaps, with possible exception of the February 2014 agreement that was derailed (under the EU and US cheers) by the Ukrainian side. Russia loses ex-ante 'federalisation' position, but gains strong assurances and supports for the ethnic Russian-speaking minorities and immediate cessation of hostilities. Moscow also gains in assurances that Ukraine is not going to join Nato and that normalisation of trade and investment regime with EU can happen sooner rather than later. Ukraine loses a chance to go 'scorched earth'-style on separatist territories, preparing them for re-Ukrainisation over time. It also loses on Ukrainian nationalists' staunch insistence on treating Russian language as a secondary language. Some in Kiev administration also lose out on the potential for joining Nato. Kiev does gain, however, external, independent monitoring of its border with Russia and the situation in the East, alongside the disarmament and demilitarisation of the separatists. Kiev also gains a chance to build up, gradually, the region to win back its allegiances. Ukraine wins a chance to formally engage with Russia on Crimea, aided by the EU and US within the new international structure. And both Moscow and Kiev can benefit from restoring trade flows and Ukraine's access to the Customs Union trade. Nato gains: it no longer has to face the unwelcome prospect of having to deal with Ukraine's possible application for membership. EU gains: it no longer has to face unilateral subsidisation of the new 'client state' as vast as Ukraine and the risks of gas and energy flows disruptions will be minimised. Is the plan above 'perfect'? Of course not. But it is pretty good. Based on purple line, there is one regime operating through H1 2008 - with shallow decline in ratio of exports to imports roughly from H2 2002 through H1 2008 pointing to relative rise of imports in overall trade. This is the consumption and construction boom. 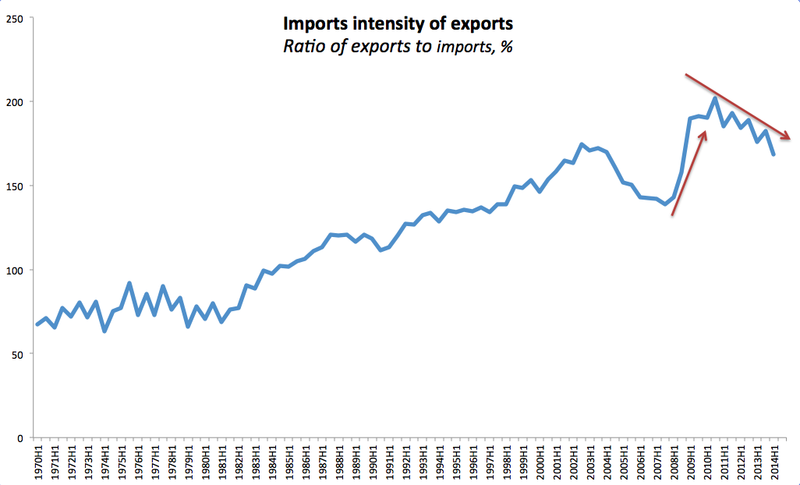 In H2 2008 we have a sharp rise in exports/imports ratio peaking at H2 2010: the period of collapsed imports relative to exports. Thereafter we have a decline in the ratio. 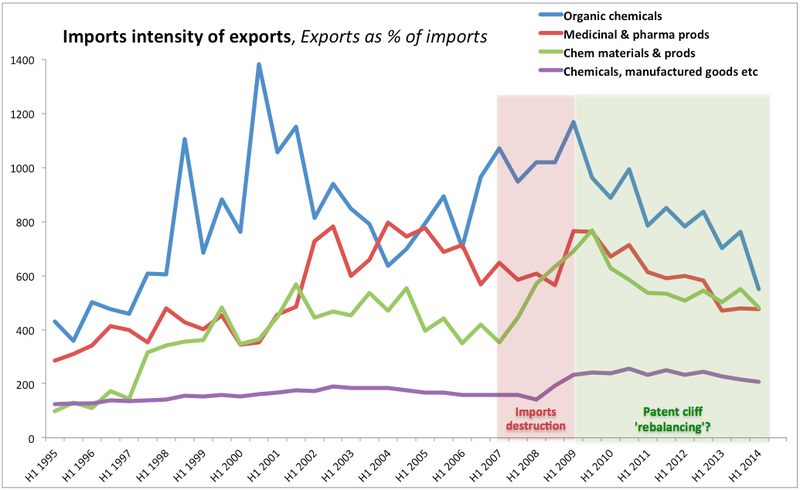 Based on Organic Chemicals (blue line) and Other chemical products (green line) we have two regimes: between H1 2004-H1 2005 and H2 2008 the two lines are broadly counter-moving. Red line includes some of the inputs into the blue line, but also domestic consumption component. This does not directly imply, but can indicate, rising amount of imports of inputs and rising (even faster) amount of outputs in the pharma sector. The evidence is weak, so not to over-draw any conclusions, it should be qualified. The second period - post H2 2006 through H1-H2 2009 we have a flattening and then peaking in exports of pharma relative to imports of pharma inputs. This is aggressive booking of profits (margin between exports and imports). After H1-H2 2009 we have rapid decline in the ratio of exports to imports in pharma sector itself, and more gentle decline in related sectors. This, with caveats once again, can signal re-balancing of tax and operational efficiencies away from Ireland being a profit-booking centre to Ireland becoming a cost-booking centre. There are many various schemes for optimising tax exposures for pharma firms, as well as other MNCs. Based on the aggregate data, it is virtually impossible to tell, which one is operating across the entire sector. But one thing is very clear from the above data - value added in the broader Organic Chemicals sector is collapsing. Worse, it is collapsing at a faster rate between H2 2013 and H1 2014 than in any period since H1 2009. It would have been good if the CSO were to publish more detailed data on this and produce an in-depth study. Somehow, I doubt they can and/or will, however. 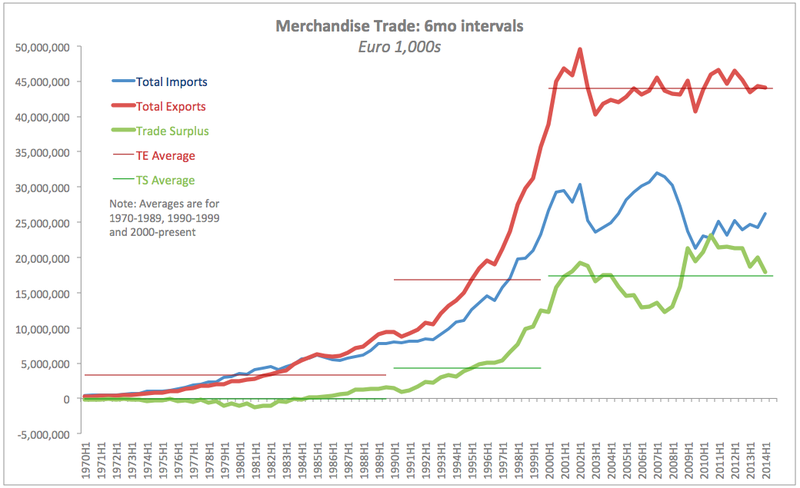 Time to update H1 results for Irish external trade in goods. As a note: CSO does not provide any information on trade in services except as a part of quarterly national accounts. Irish exports of goods in H1 2014 stood at EUR44.096 billion, down 0.54% on H2 2014 and up 1.45% y/y. Compared to 3 years average, exports are down 2.27%. Compared to other H1 records, H1 2014 is up on H1 2013, but down on H1 2011 and 2012. Current reading is slightly behind EUR44.142 billion average H1 reading for 2000-2014 period and well below EUR45.077 billion H1 average for 2009-present. Irish imports of goods rose in H1 2014 to EUR26.189 billion an increase of 7.8% on H2 2013 and a rise of 5.96% y/y. Imports are now up 7.28% on 3 year average and are at their highest level since H2 2008. As the result of these trends, Trade surplus (for goods trade alone) has fallen to EUR17.907 billion, down 10.65% on H2 2013 and down 4.49% y/y. Compared to 3 year average, trade surplus is down 13.53%. 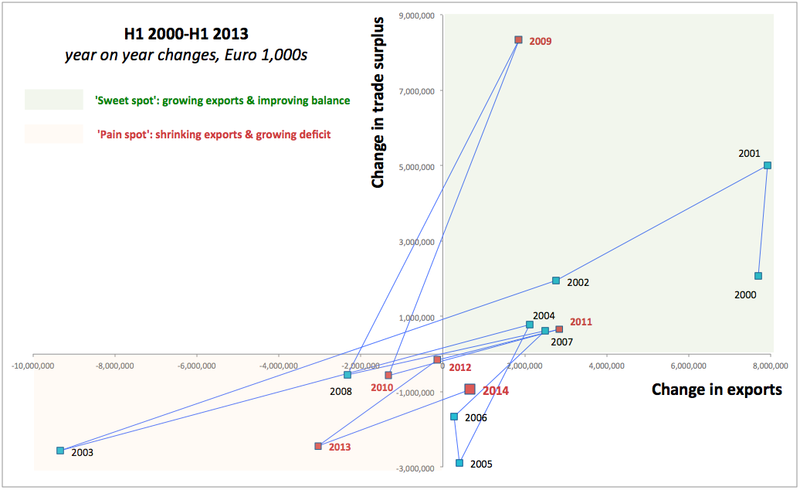 H1 2014 trade surplus now stands at its lowest level in 6 years. Charts below illustrate the above trends. 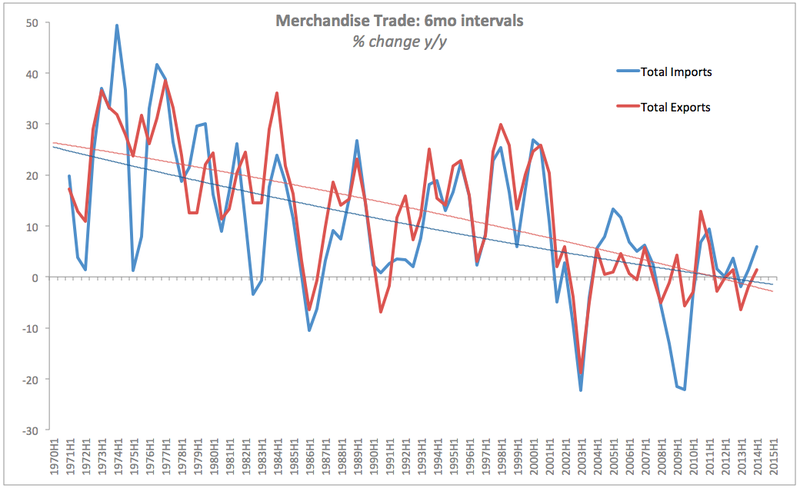 So overall, trade in merchandise is providing negative contribution to GDP growth y/y so far in 2014. Let's hope H2 will reverse this. Earlier today, Ifo Institute published its survey of business sentiment in Germany. 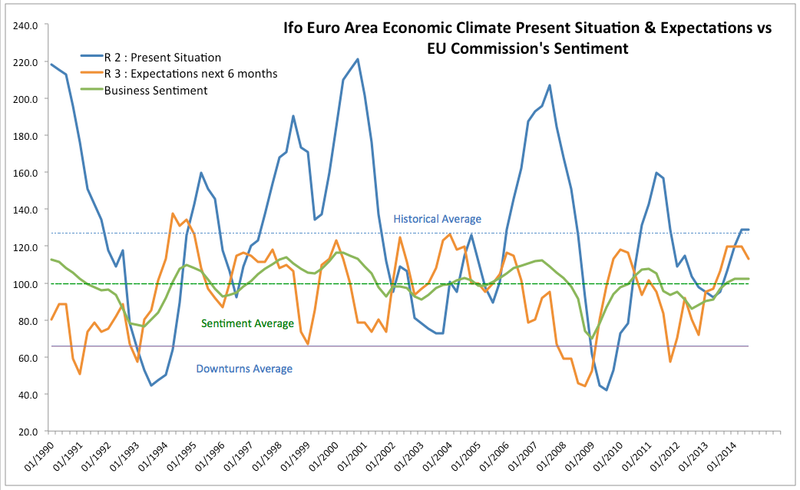 Here is the latest analysis of their data alongside the previously released euro area sentiment. Euro area economic climate survey returned index reading of 118.9 at the start of Q3 2014, down sharply on Q2 2014 reading of 123.0 and the lowest reading in 3 quarters. Present situation reading remained unchanged at 128.7 which is identical to Q4 2011 reading and the highest reading since Q1 2012. However, expectations 6 months out index slipped to 113.1 from 119.7 3 months ago and is now at its lowest level for 4 quarters running. With all of this, the expectations gap relative to current conditions reading - the metric that signals the expected contraction if below 100 and expansion if above 100 - has fallen to 87.9 from 93.0, marking the third consecutive quarter of decline and the third consecutive quarter of staying below 100. That said, the error direction - the difference between previous expectation for current period and current conditions - remains negative at -9.0 points, for the fourth consecutive quarter running. The above trends were also reflected in the EU Commission business sentiment surveys. Based on July data, Q3 sentiment is on the declining side, with July reading of 105.8 for EU27, down from Q2 2014 end of quarter reading of 106.4. For the euro area the index remains basically unchanged at 102.2 in July compared to 102.1 in June 2014. 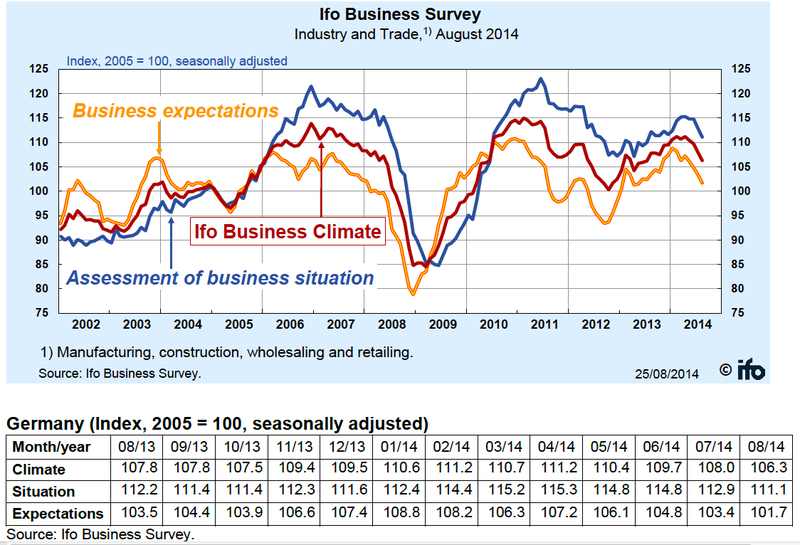 For Germany, Ifo Business Climate Survey for August 2014 came in with rather negative results. Index for industry and trade fell in August to 106.3 points from 108.0 in July. German companies are also more sceptical than in the previous month. As Ifo release states: "The German economy continues to lose steam". Current reading is at the lowest level since mid-2013 and the last time index increased was back in April 2014 with a significant rise last clocked in March 2014. A baker running three busy shops in the area raises as his first complaint high taxes on business, second - high taxes on households and third - lack of credit. For generations, his family owned the bakeries that supply local communities with fresh goods, working from 3 am through evening 6 days a week. Now, the banks with which they have been dealing over the decades are no longer lending, equipment is starting to experience more frequent failures, and customers are slipping into arrears. He holds a ledger of customers credit, like many other shops around, and says majority of businesses in towns are bartering food for small work. 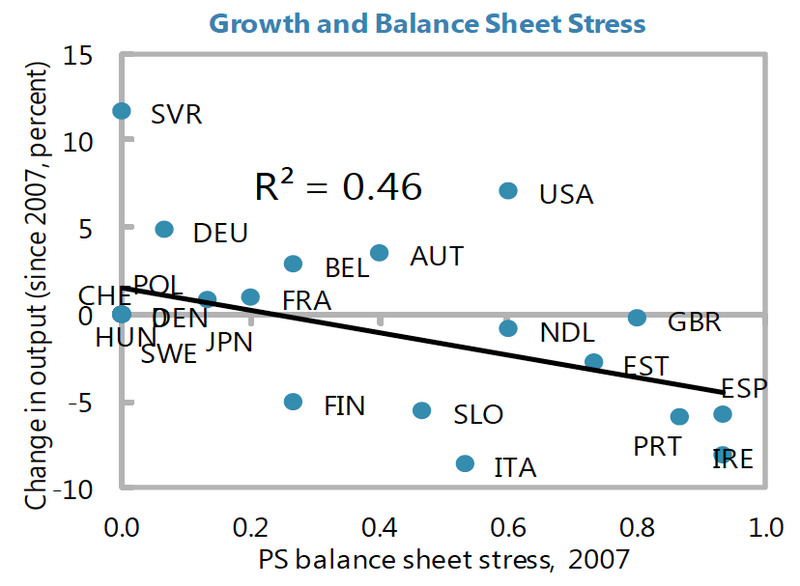 It is bad news because Italy is not very good at structural reforms front. Historically and currently. 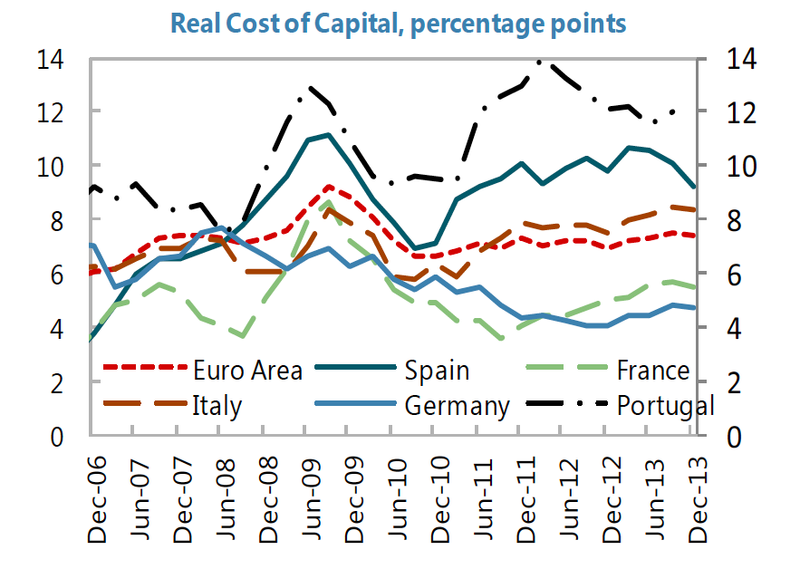 Charts above clearly show that crisis-related improvements in Italian economy's labour cost competitiveness are lagging those in other 'peripheral' countries in absolute terms. In relative (to EA17) terms, the country has posted a loss in productivity over the years of crisis that is deeper than for any other country covered in the IMF sample above. This loss in productivity was not offset by the declines in direct labour costs. 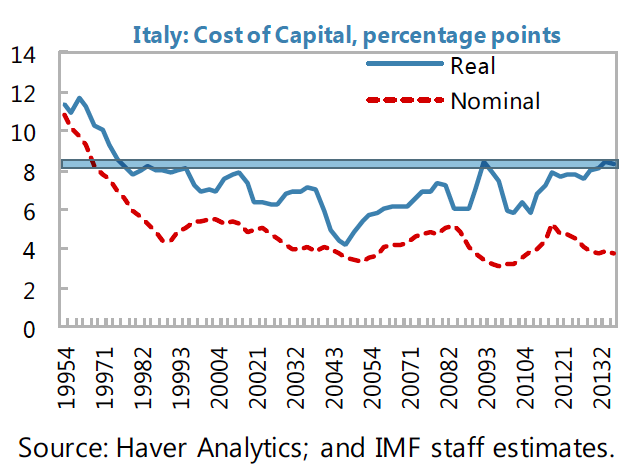 Thus, in the nutshell, while Italian labour became less productive it also became lower paid - a twin problem, as the former reduces economy's capacity to compete in the international markets, while the latter hammers domestic demand (consumption and investment). It is a tale of 'head sinks, tail sinks' dynamic. And the above does not reflect credit deterioration in trading sector that can be expected under the Russian sanctions. One of the largest producers of prosciutto in the famed city of San Daniele spots rows and rows of ham legs drying out labelled for the Russian market. The curing facility stretches over 1/4 of a mile and 'Russia-bound' ham is about as dominant as that set for the U.S. The final destination of the former is now highly uncertain, but trade and production credits used to fund it are going to come due. Back in the piazza of the regional capital - at the junction of the North and South main streets mentioned in the first post - five banks once stood opposite of one another. Two branches are gone completely, the third one has shrunk to about 1/4 of its original footprint. All remaining beaches' windows are peppered with offers of mortgages and business loans at seemingly benign rates of around 2-2.5% above the 3mo EURIBOR. None, according to the local business people and ordinary homeowners I spoke to are actually lending. 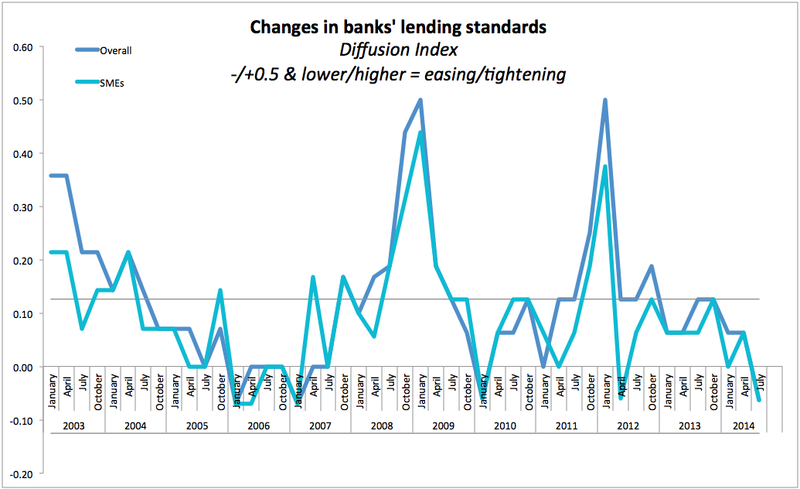 While diffusion index for lending standards in Italian banks has finally posted some signs of easing at the end of Q2 2014 (see chart below based on Banca d'Italia data), overall conditions remain tight and the recent easing itself is statistically weak. 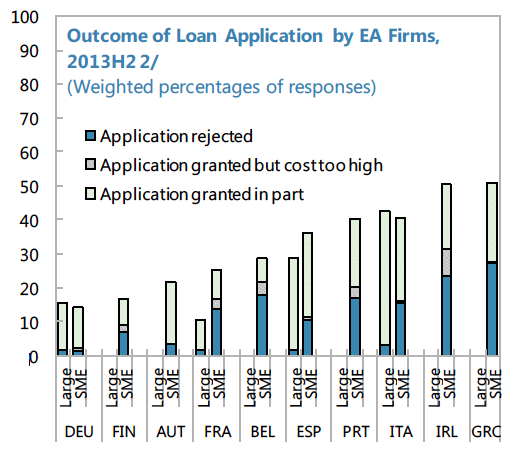 Meanwhile, Banca d'Italia lending surveys show that aside from nominal pricing of the loans, loans approvals conditions continued to tighten at the end of Q2 2014 for collateral requirements, and remained unchanged for margins, non-interest costs and charges, size of loans issued and covenants. 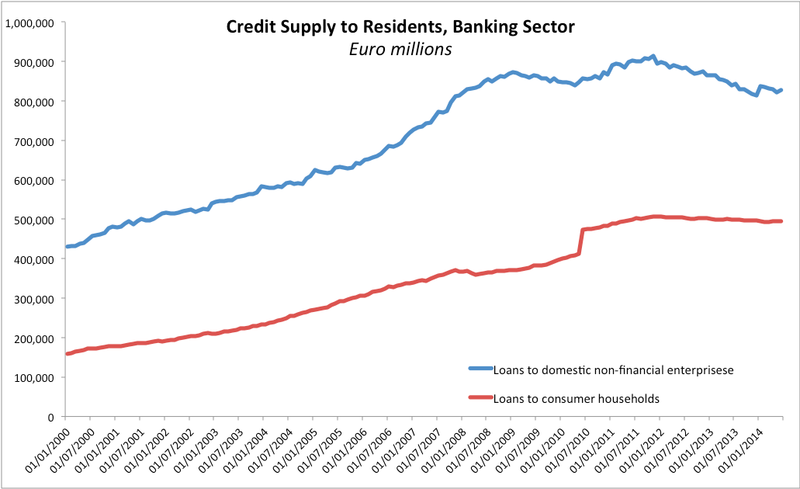 As the chart above shows, domestic resident enterprises stock of credit has failed to recover from the crisis-period decline that set on in late 2011, while domestic households loans (relating to consumption) have remained on the gently declining trajectory since early 2012. Lacking consumer spending, suffering from high taxes and prohibitive regulatory environments, credit-less and wanting for structural reforms, majority of which, even when enacted, are not followed through, Italian economy is now an ageing liner listed lifeless on the rocks with no tide coming in to lift it off and no repair crews dispatched to make it right. Per latest Eurostat estimates, Italy's real GDP H1 2014 was 9.1% below its pre-crisis peak and 9.2% below the levels registered at the end of 2006. Country real GDP index now stands at a historical low - performance only comparable to that of Cyprus with every other euro area economy having seen at least modest increases in real GDP compared to the crisis trough. Either a heavenly slice of economic hell or a hellish corner of cultural haven, Italy is a society which is facing into a prospect of economic non-future within the euro area. That this conclusion is obvious in the heart of its once vibrant corners - the proudly work- and family-centric North East - is simply damning and infinitely sad. 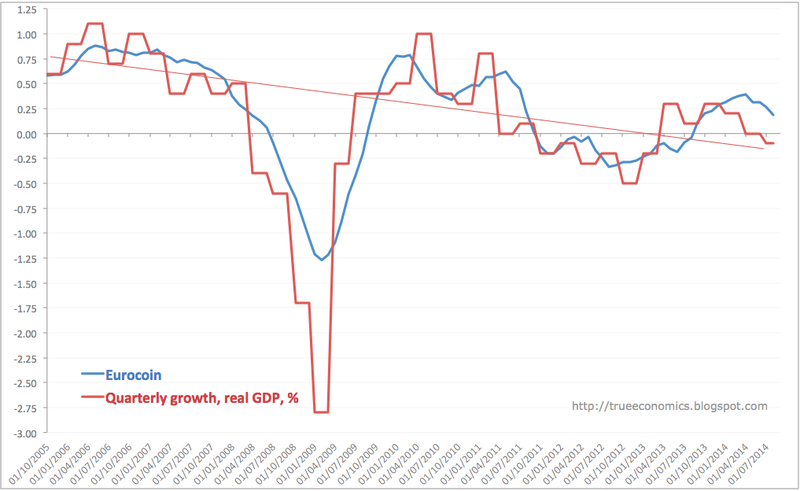 This is part 1 of the two-parts post on the current economic conditions in Italy. A North-Eastern Italian provincial capital - a normally buzzing and lively medieval city with proud Roman history and previously vibrant high value-added industries and high tech services sits quiet and semi-deserted on the weekend afternoon. This August, a slow month by normal metrics of shoppers numbers and restaurants and cafe's patrons counts, is marked by the waves of recent closures of small businesses across the province. It is also marked by the official return of Italy to a recession - its third one since 2008. The two halves of the pedestrianised main street tell the tale of the country-wide economic demise. On the South side of the old piazza, the main street is dotted with few empty shop fronts. Established as a trading centre of the city centuries ago, this section of the city centre is primarily occupied by shops and businesses that owned their buildings over generations. No rent to pay means the businesses remain open, even as international and Italian brands are shutting down their local operations. The vacancy rate of shopfronts is running at around 10% here. The Northern side of the street is smarter, better designed and more modernised. It was 'regenerated' in the mid-2000s and populated by trendier shops and eateries catering to Yuppie customers. Back in 2007-2008, the street was abuzz with activity: well-dressed patrons, predominantly under the age of 40 browsing in the cutting edge designer stores and boutiques, while visitors from the province and beyond soaked in the atmosphere of the new social hub in cafes, enoteche and trattorie. This year, more than three out of four businesses are shut, empty windows and closed doors greet a rare passerby. Unable to fund rents, as well as high taxes and charges, smaller business owners have gone under. Those supplying locally-demanded daily goods, such as fresh groceries, are trading elsewhere, some dealing exclusively in cash with their established customers. Majority are simply gone. Consumer demand is weak. As the result, Italy's HICP inflation is down to 0.0% in July 2014 - the fifth weakest inflation performance in the euro area and down from 1.2% in July 2013 and 12 months average of 0.6% for the 12 months period through the end of last month. 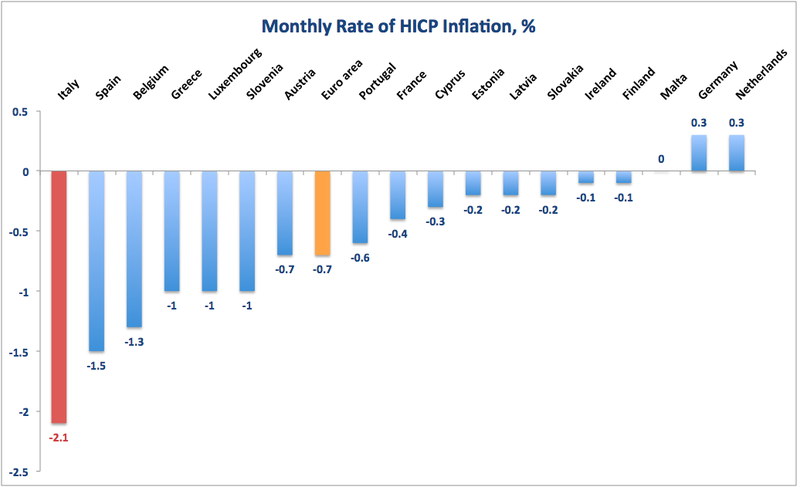 At -2.1% monthly rate of HICP inflation in Italy is the worst of all euro area states. Aptly, Italy's retail sales PMI remains below 50.0 line without interruption since Q2 2011. July reading was 43.4 down from 43.8 in June. 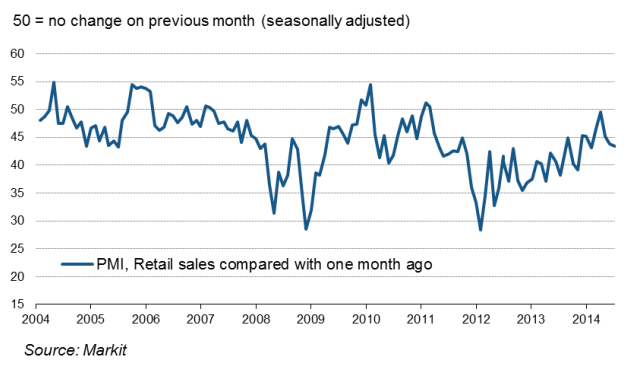 Since January 2014, through May 2014, retail sales have risen by 0.1% cumulatively, with may posting 0.3% m/m decline. In real (inflation-adjusted) terms, turnover index in the retail trade in May 2014 stood at 92.6 below 93.8 recorded in June 2011 (based on working day adjusted non-seasonally adjusted data), but ahead of June 2013 level of 88.9. Few kilometres down the road, another wealthy Northern Italian town is showing the same signs of decline. A builder, having completed an apartment block in 2009, was forced out of business by the city authorities saddling his business with the staggering cost of rectifying a planning error committed by… you guessed it, the city authorities. After sitting on the market for 4 years with no takers, the apartments went for auction earlier this spring. Guiding prices ranged from EUR20,000 for a one-bedroom to EUR46,000 for three bedroom flats. Back in 2004-2006 these properties would be sold off-plans for around EUR150,000 one-beds and EUR280,000 for three-beds. The auction flopped: out of 21 properties on the market, only 9 sold. Prime city-centre retail space on the ground floor of the building remains only 1/5th occupied. Country construction sector activity is still down 43% on the pre-crisis peak (the sixth largest decline in the euro area) with Q1 2014 reading marking all-time low, the only country in the euro area with construction posting historical low in 2014. And housing markets are singing blues. From the beginning of Q2 2013 and through the end of Q1 2014, Italian house prices fell 4.43%, while euro area as a whole experienced house price deflation of just 0.3%. 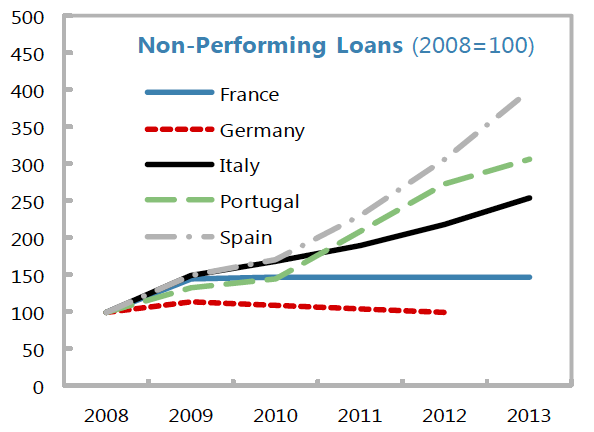 Within the euro area, only Cyprus and Slovenia posted worse 12 months cumulative performance. Four internationally trading factories, including two suppliers of high-tech household equipment with export markets around the world, have shut doors since the onset of the Great Recession - all employed more than 200 people each at the peak and all have been in business for decades. In a telling sign of the times, one smaller family firm, counting five generations in business and trading with some exports, closed down while the proprietors continue to trade on a highly reduced volume. New trade is all local and cash-only. Across the area, work supplied directly to consumers is now being routinely quoted priced 'with receipt or without' and in many cases, even registered sales of goods and services are openly under-declared on invoices to avoid VAT and profit taxes. 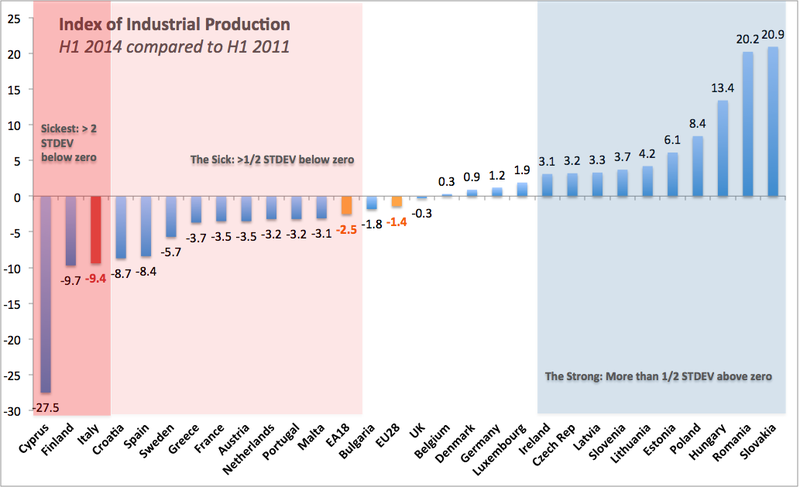 Italy's industrial production stood at 106.6 in H1 2011, by H1 2014 this fell to 97.2. On average, industrial production fell in Italy at an annual rate of 2.98% between the first half of 2011 and the end of June 2014. Italian Manufacturing PMIs fell from 52.6 in June to 51.9 in July although index remains above 50 line continuously since Q3 2013. Ditto for services PMI which fell from the 43-month high of 53.9 in June to 52.8 in July. Activity down and margins are slipping. Industrial production prices rose 0.1% in June 2014 m/m marking the first month of positive inflation after four consecutive months of producer prices deflation. Since January 1, 2014, industrial producer prices are down 0.5% cumulatively, which is not helping companies profitability or their ability to sustain debt servicing and employment. How bad profitability margins are? In June 2014, index of industrial producer prices for domestic market in Italy stood at 106.5. This is below June 2012 reading (109.2) and June 2013 reading (108.6). Industrial producer prices excluding energy sector are virtually flat in June 2014 compared too June 2013. Industrial parks strewn across rural countryside - once sporting new buildings and full parking lots for staff cars - are half-empty, with weeds taking over front gardens and previously carefully landscaped lots. Empty crates, unsold inventories and rusting machinery still sit around the worker-less buildings bearing the names of larger family businesses. An area once a magnet for labour migrants from Italian South, Eastern Europe and Asia is now once again sending emigrants to Germany, the UK, US and Australia. On the good news side, Italy's trade surplus (goods only) is up from EUR8.2 billion in January-May 2013 to EUR14.1 billion in January-May 2014, but more than half of this improvement (EUR3.7 billion) was down to decline in imports, with exports increases accounting for just EUR2.2 billion. 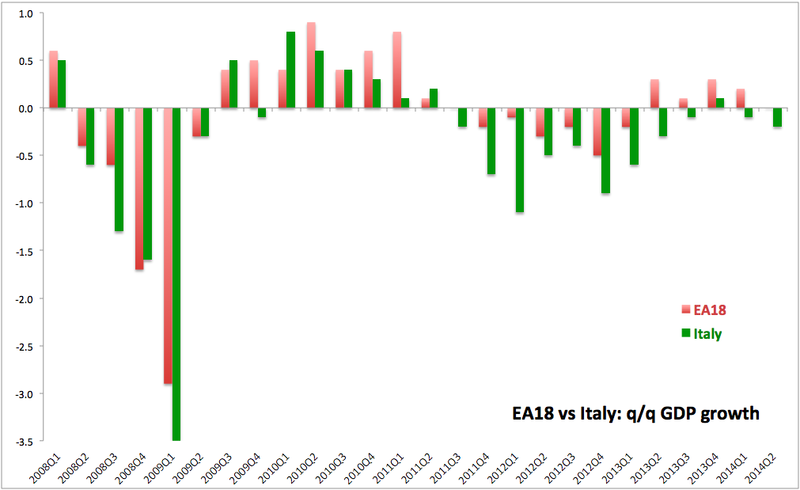 On a seasonally-adjusted basis, Italian exports were down 3% m/m in June 2014 and country trade balance has deteriorated from EUR1.9 billion surplus in May 2014 to EUR1.7 billion in June. These figures are not reflective of the Russian sanctions against the EU that came into effect in July 2014. In my conversations with a number of local residents, sanctions loom large. Local area businesses supply higher-end luxury household goods to Russia and via Russia, the rest of the CIS. Some - such as producers of luxury bathtubs and bathroom equipment - are impacted only indirectly, via general slowdown in Russian demand. Others - such as suppliers of premium food and wine - are fearing for their business in the wake of Russian government retaliatory sanctions of agricultural and food imports from EU. All are worrying about energy costs impact of the Ukrainian mess. Then there's Italian Government. 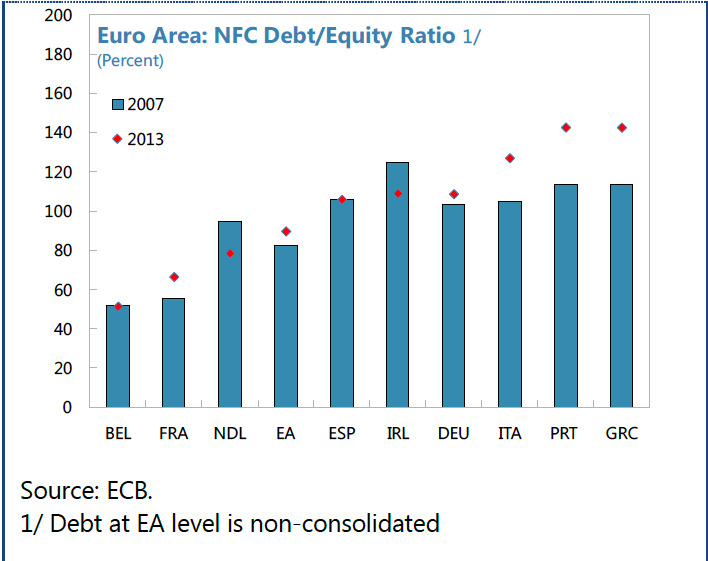 The country fiscal problems are epic even by already stretched euro area standards. IMF forecasts 2014 General Government debt to reach 134.5% of GDP even before the latest data pointing to a possible economic contraction for the full year GDP. 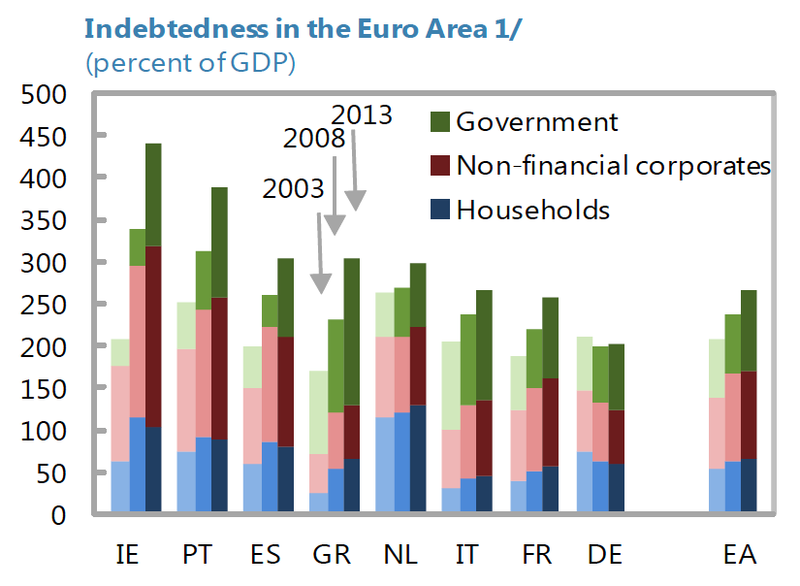 That is the second highest public debt burden in the common currency area after Greece. Between 2012 and 2014, Italy's Government debt is forecast to increase by EUR144.2 billion with cumulated Government deficits amounting to EUR193.9 billion in 2011-2014, of these EUR105 billion is structural deficits. Country structural deficits are rising, not falling, up from EUR5.5 billion in 2013 to the projected EUR13.3 billion in 2014. 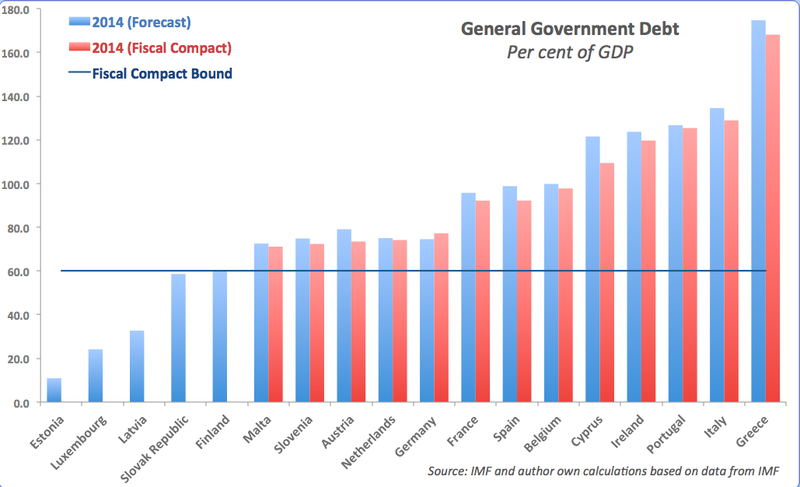 At current bond yields, Italy needs ca 2.5% annual growth in GDP just to stay on a flat debt trajectory. Based on its current outstanding debt mix (referencing maturities and associated yields), this number rises to over 3.3%. 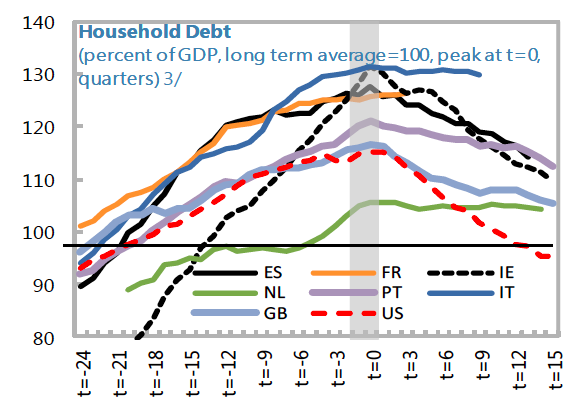 While on debt topic, corporate indebtedness is not improving either, despite years of austerity and financial repression. Here's the latest summary from the IMF (July 2014) covering leveraging levels across main euro area economies. 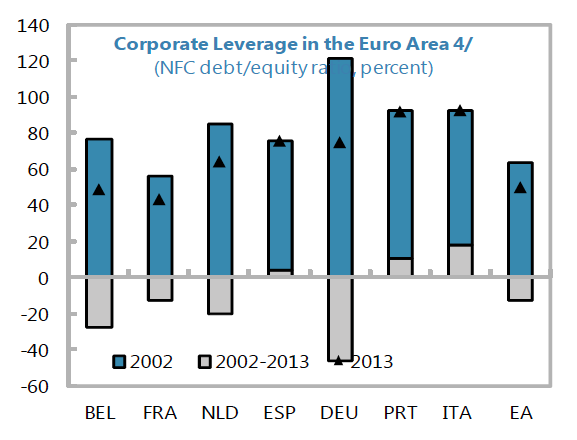 Italy's corporate leverage is getting worse faster than any other euro area economy, save Greece and Portugal. This means two things: firms are having difficulties funding replacement and expansion capital, technological modernisation stalled productivity across factors of production is going nowhere; and employment is unlikely to improve as cash flows are constrained by the need to sustain amortisation and depreciation in the environment of the high real cost of funding capital (which in part reflects also depressed margins). 21/8/2014: G20: Does it matter?